March 15, 2019 – Northwest Bank recently made a $4,000.00 contribution to Rainbow Corner Preschool, which is part of CARE for Children. The preschool is an approved Pre-Kindergarten Scholarship Organization, through the State of Pennsylvania’s Educational Improvement Tax Credit Program (EITC). Norm Strotman, senior vice president, regional commercial lender at Northwest Bank, visited with Rainbow Corner Preschool students at the Ashley Booth Griffin CARE for Children Center on Friday. Pictured from left are Sena Noguchi, Strotman, Emma Carey, and Kimberly Engstrom, M.Ed., CARE preschool director. Noguchi, 5, is the daughter of Yuko and Tomofumi Noguchi of Bradford and Carey, 5, is the daughter of Patrick and Kathi Carey of Bradford. Contributions made through the EITC program help CARE provide tuition to eligible Pre-K students to attend preschool, making early learning more accessible and affordable for working families. Northwest Bank’s contribution will help fund scholarships for the 2019-2020 school year. February 28, 2019 – The Erie Traveling Zoo visited Rainbow Corner Preschool on Thursday. The program, led by Amy Heisler, the zoo’s off-grounds coordinator, was called Smitten for Mittens and revolved around the book The Mitten by Jan Brett. Rainbow Corner preschoolers listened to the story, learned facts about each animal, and visited with a hamster, rabbit, collared dove, and skunk, some of the animals who were featured in the story. The Erie Traveling Zoo enables students to go beyond the limits of a book and allows them to see, hear, and touch animals and artifacts while learning at the same time. The zoo visit is incorporated into the STEM (Science, Technology, Engineering, and Math) curriculum at Rainbow Corner with zoo-themed activities, stories, and games. Rainbow Corner Preschool is operated by CARE for Children and provides early childhood education for children ages 3-5. It is located at the Ashley Booth Griffin CARE for Children Center in Bradford. 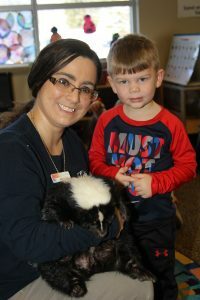 Pictured: Rainbow Corner Preschool student Beckett Burns poses with “Archie,” a skunk who is being held by Amy Heisler, off-grounds coordinator at the Erie Zoo. Burns, age 3, is the son of Corey and Lindsay Burns of Bradford. 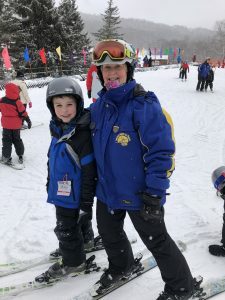 February 18, 2019 – CARE for Children held its annual Adaptive Ski Outing at Holiday Valley Ski Resort on Monday, with 13 children in attendance. Each child was paired with one or more volunteer instructors and given expert instruction as part of the Holiday Valley Lounsbury Adaptive Ski Program, which is a chapter of Disabled Sports/USA. Pictured is Josh McClymonds, age 7, along with volunteer Lounsbury Adaptive Ski Program instructor Anne Slater. Josh is the son of Seth and Beth McClymonds of Bradford. The ski outing was sponsored by the Rotary Club of Port Allegany, Todd Busses donated transportation to and from Ellicottville, N.Y., and Walmart provided snacks and refreshments. The Adaptive Ski Outing is just one of many therapeutic recreation and respite programs that CARE provides for children of all abilities. 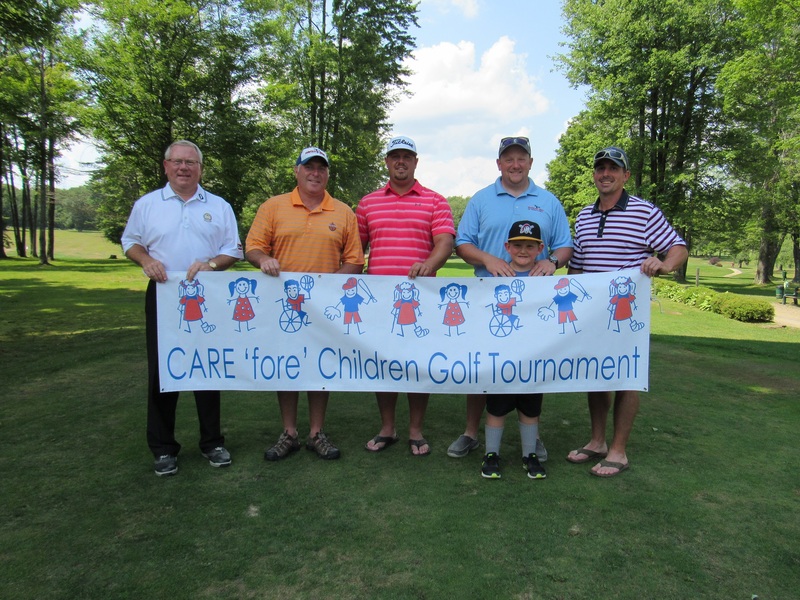 CARE is a non-profit organization providing pediatric services for children in McKean County, Pennsylvania and the surrounding region. February 15, 2019 – CARE for Children, a non-profit organization that provides services to children of all abilities, is offering a free Infant Safe Sleep Training opportunity for at-home visiting and health professionals on Monday, March 11, 2019 at Beacon Light Behavioral Health Systems from 2:30 to 4:00 p.m. The training will cover fundamentals of Infant Safe Sleep, how to promote a Safe Sleep environment for babies, and an overview of the McKean County Cribs for Kids® Program. CARE staff members, Kimberly Engstrom, M.Ed., preschool director and early intervention special instructor and Joy Haney, MSW, LSW, social worker, will present the training. Engstrom and Haney have both been trained as Safe Sleep Educators by the national Cribs for Kids® program. Registration includes workshop materials and light refreshments. Participants will earn 1.5 infant-toddler training hours. The Infant Safe Sleep training is sponsored by the United Way of the Bradford Area, Inc. and hosted at Beacon Light Behavioral Health Systems. The McKean County Cribs for Kids® Program is generously funded in part by the Philo and Sarah Blaisdell Foundation. To register for the training, contact CARE for Children by phone at (814) 362-4621 or email at reception@careforchildren.info. More information on safe sleep for infants and the Cribs for Kids® Program can be found at CARE’s website https://careforchildren.info/cribs-for-kids/. December 7, 2018 – CARE for Children is pleased to announce the launch of a local Cribs for Kids Program and Infant Safe Sleep initiative under the umbrella of the Safe Kids Pennsylvania-McKean County Partnership. The program developed by Cribs for Kids® National Infant Safe Sleep Initiative provides safe sleep environments for families in need and provides a consistent safe sleep message to the community. The goal is to reduce the number of accidental infant sleep-related deaths. According to the National Cribs for Kids Program, SIDS is the leading cause of death in infants age one month to one year, and in the United States over 3,500 babies will die unexpectedly each year. Research indicates that many and perhaps most of these deaths are related to an unsafe sleeping environment. Researchers do not know what causes SIDS, but have identified modifiable risk factors. Two important strategies to reduce these deaths are making sure an infant has a safe place to sleep, and providing education to families. 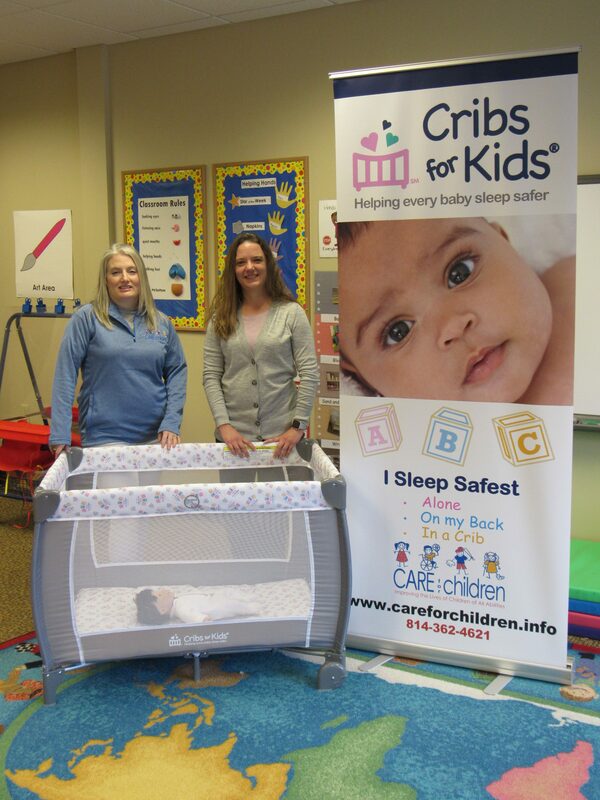 Two CARE staff members, Kimberly Engstrom, M.Ed., preschool director and early intervention special instructor and Joy Haney, MSW, LSW, social worker, have both been trained as Safe Sleep Educators by the national program and will make home visits to provide education and set up the cribs. With funding from the Philo and Sarah Blaisdell Foundation, CARE was able to purchase portable cribs from the National Cribs for Kids Program as well as fitted sheets, infant sleep sacks, and educational materials. Health care providers, at-home visitors, Children and Youth Services, and early childhood programs are all encouraged to make referrals to the program. More information on safe sleep for infants and the Cribs for Kids Program can be found at CARE’s website https://careforchildren.info/cribs-for-kids/. CARE for Children is a non-profit organization which provides child safety and injury prevention initiatives through its leadership of the Safe Kids Pennsylvania—McKean County Partnership. The partnership aims to promote the prevention of accidental child injuries through education, collaboration and advocacy. 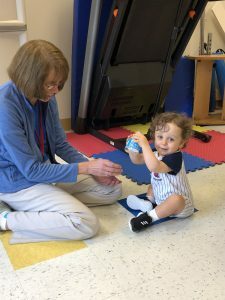 CARE also provides pediatric therapy services, early learning programs, and community outreach services for children of all abilities in the region. Cribs for Kids is a national infant safe-sleep education program that helps to reduce the risk of injury and death of infants due to accidental suffocation, asphyxia, or undetermined causes in unsafe sleeping environments. Since 1998, Cribs for Kids has been making an impact on reducing the rate of infant sleep-related deaths by educating parents and caregivers on the importance of practicing safe sleep and providing portable cribs to families who otherwise cannot afford a safe place for their babies to sleep. Headquartered in Pittsburgh, PA, Cribs for Kids currently has more than 950+ partners throughout the United States implementing infant safe-sleep programs in their communities. All education is based on the AAP Guidelines for Infant Sleep Safety. Visit https://cribsforkids.org for more information. Photo Caption: CARE for Children staff members Joy Haney, MSW, LSW and Kimberly Engstrom, M.Ed. are shown with a Safe Sleep display, including a portable crib that is available to families in need. 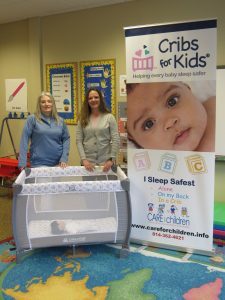 Haney and Engstrom have both been trained as Safe Sleep Educators by the National Cribs for Kids Program and will make home visits to provide infant safe sleep education and set up the cribs. November 29, 2018 – The annual meeting of the CARE for Children Board of Directors was held Thursday evening at the Bradford Club. The CARE Board of Directors honored McKean County Special Olympics, Evergreen Elm, and Futures Rehabilitation Center with the organization’s 2018 Community CARE Awards. 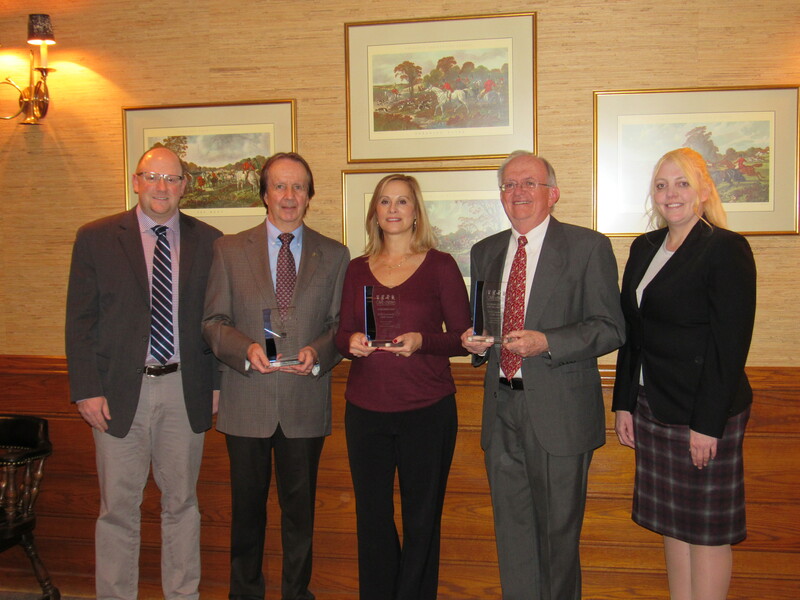 CARE board members and 2017 Community CARE Award Recipients Mick Marshall, Karen Gelston, and Joseph Yaros presented the three awards respectively. The Community CARE Awards were established by the Board of Directors in 2003 to recognize outstanding contributions to the agency and to the children and families to whom CARE provides service. This year the board determined to recognize these outstanding organizations for their active partnership with CARE in building an inclusive community and for successfully working together to provide a continuum of services for people of all abilities. “This year we are pleased to recognize three organizations who not only exemplify CARE’s vision of creating an ability-focused culture but amplify it with their services and programs,” said Mick Marshall, CARE board member. “We are thankful for their partnership with CARE to not only promote inclusion but to celebrate ‘all abilities,’” he added. During the meeting, CARE Board President Norm Strotman, provided a review of CARE’s 2017-2018 fiscal year which had an overall theme of ‘Engage, Empower, and Inspire’ and highlighted the organization’s increase in the overall number of services including Early Intervention birth to three, school-based therapy, therapeutic recreation, early learning programs, community outreach, and child safety initiatives. Strotman also recognized outgoing board member Jan Brown for her longstanding and dedicated service to the organization. Brown recently completed an eight year tenure as a board member. The CARE Board also honored employees who have reached milestone years of service at the organization. Tina Martin, executive director, recognized the following staff for reaching milestones: Valorie Coast, finance & office manager, 15 years; DeAnn Persichini, COTA/L, occupational therapy assistant, 15 years; Janice Stiles, preschool aide, 15 years; Katlyn Hillard, M.Ed., summer early learning programs and recreation, 10 years; Barbara McGarry, preschool aide, 10 years; Dana Pence, PT, physical therapist, 10 years; and Leslie Kallenborn, development & marketing coordinator, 5 years. 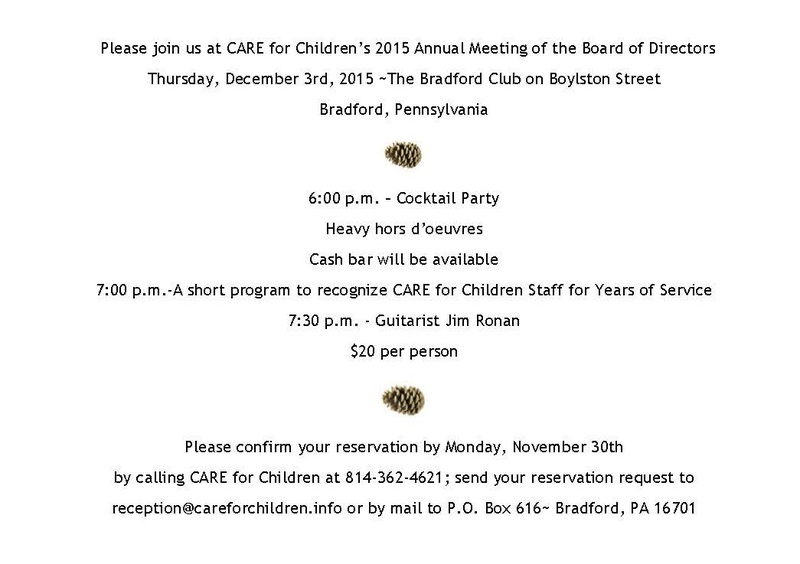 November 8, 2018 – The CARE for Children Board of Directors will host a reception as part of their annual meeting on Thursday, November 29th at 6:00 p.m. at the Bradford Club. During the event, the Board will honor Evergreen Elm, Futures Rehabilitation Center, and McKean County Special Olympics with Community CARE Awards. The awards typically recognize contributions in support of CARE’s mission of improving the lives of local children of all abilities. This year the board determined to recognize these outstanding organizations for their active partnership with CARE in building an inclusive community and for successfully working together to provide a continuum of services for people of all abilities. The Board will also honor CARE staff who have reached milestone years of service to the organization. The cocktail reception will feature heavy hors d’oeuvres and a cash bar. Reservations for the annual meeting will be accepted through Wednesday, November 21st, and can be made by calling the CARE office or by emailing reception@careforchildren.info. The cost is $25 per person. October 17, 2018 – CARE for Children, a non-profit organization that provides services to children of all abilities, will sponsor a free family support program, “How to be Your Child’s Biggest and Most Effective Supporter,” presented by Joy Haney, MSW, LSW, CARE social worker, and Gretchen Daugherty, family advocate on Tuesday, October 23rd at 6:00 p.m. at the Hill Memorial United Methodist Church in Bradford. Geared for parents and/or caregivers of children with delays or special health care needs, the program will provide valuable information on resources and other supports available throughout childhood and the transition to adulthood. Participants will also have the opportunity to create a personalized booklet about their child and his/her family to use at school or with other helping professionals in the child’s life. Materials and refreshments will be provided. Advance registration is requested. Please contact CARE at 362-4621 for more information or to register. CARE for Children’s family support workshops are funded in part through Community Impact funding through the United Way of the Bradford Area, Inc.
October 8, 2018 – Physical Therapist, Ann Kane, works with Archer Gumtow, 18 months, at CARE for Children’s Baby and Toddler Screening held on Monday at the Ashley Booth Griffin CARE for Children Center in Bradford. Children who attended received a developmental check-up which included screenings by CARE therapists focusing on fine and gross motor skills; language; and a social-emotional assessment. Vision screenings were provided by the McKean County Early Intervention birth to 3 program. In cooperation with ATA, free transportation was available. September 28, 2018 – CARE for Children will host a free Baby and Toddler Screening Day on Monday, October 8, 2018 from 2:00 p.m. to 5:30 p.m. at the Ashley Booth Griffin CARE for Children Center on East Main Street in Bradford. The Screening Day will provide a developmental check-up for infants and toddlers, birth up to age three. Screenings will include fine and gross motor skills; language; vision; and a social-emotional assessment. There will also be stations on safe sleep, tummy time, baby safety, and other important developmental information. “Developmental screenings are essential for babies and toddlers because early detection and treatment are key in helping children with deficits better reach their potential and provide a bridge to services for families with referrals to the early intervention system, as well as other agencies,” said Tina Martin, CARE executive director. The screening day is not only for parents/caregivers who have developmental concerns for their child, but for any parent/caregiver that wants to learn about milestones and how to help with their young child’s development. Children attending will receive a free developmental toy. Free transportation is available for families in Bradford in cooperation with ATA. To register or for more information, please call CARE for Children at 814-362-4621 or email reception@careforchildren.info. Advance registration is requested but not required. August 14, 2018 – CARE for Children, a non-profit organization that provides services to children of all abilities, sponsored a free family support program, “The Story of My Child” presented by Joy Haney, MSW, LSW, CARE social worker, and Karen Gelston, MSW on Tuesday evening at the Ashley Booth Griffin CARE for Children Center in Bradford. Geared for parents and/or caregivers of children with delays or special health care needs; each participant created a personalized scrapbook about their child and his/her family to help other professionals better understand the child and his/her specific needs and strengths. The book can be used at school, daycare, the doctor’s office, or during community activities. 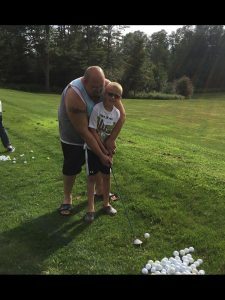 August 8, 2018 – Pine Acres Country Club hosted CARE for Children’s Adaptive Golf Outing for children of all abilities on Wednesday evening. Fourteen children ages 6 to 16 hit on the driving range, practiced on the putting green and hit balls on the course under the volunteer instruction of PGA pro Kirk Stauffer and several community volunteers. 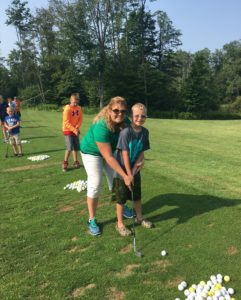 The CARE Adaptive Golf Outing is part of CARE’s therapeutic recreation program for children who receive school-based therapy services. The program is funded in part by the United Way of the Bradford Area, Inc. Transportation was donated by Todd Busses of Eldred. August 5, 2018 – Premier Sponsors Allegheny Bradford Family of Companies and Philo & Sarah Blaisdell Foundation, along with Lead Sponsors Highmark Blue Cross Blue Shield, and Zippo/Case Museum, presented this year’s CARE ‘fore’ Children golf tournament on Sunday at Pine Acres Country Club. The tournament raised over $27,000 with proceeds benefitting CARE’s free community outreach services for children with disabilities; pediatric developmental and preventative screenings; therapeutic recreation programs; child safety initiatives that prevent disabilities and fatalities from accidental injuries; and inclusive early learning programs. Kids & Cancer Benefit and Marshall Insurance Services were course sponsors; and CNB Bank and Simon Financial Services were flight sponsors. Eight other businesses sponsored half-flights, including Greg and Cherie Booth, Carlson Dental Associates, Hubbard-Bert, Inc., Richard and Ann Kessel, Northwest Bank, Pine Valley Landscaping, Shults Toyota, and Sundahl & Company Insurance. In total, over 190 donors, businesses and organizations provided sponsorships and in-kind donations of prizes and other services to support the tournament. Thirty teams comprised of 120 golfers made up the field. Each year CARE provides distinct services to improve the lives of children of all abilities in McKean County and the surrounding region. Events like the annual golf tournament make these services and programs possible. Photo Caption: The team of Mike Gleason, Norm Strotman, Chace Farrell and Jay Pecora shot a score of 57 to win the CNB flight at the 25th annual CARE ‘fore’ Children golf tournament Sunday at Pine Acres Country Club. Pictured from left are Kirk Stauffer, Pine Acres pro; Jay Pecora; Mike Gleason; Norm Strotman, Owen Strotman, age 7; and Chace Farrell. Strotman also represents CARE for Children as a board member and golf tournament co-chair. 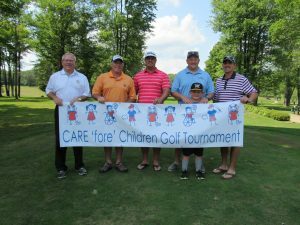 July 16, 2018 – Pine Acres Country Club will host the 25th annual CARE ‘fore’ Children Golf Tournament, Sunday, August 5, 2018. The tournament is a four-person scramble with an 8:30 a.m. shotgun start. Flights are based on the team member with the lowest handicap. The entry fee is $45 for Pine Acres members and $55 for non-members, which includes green fees, food, and refreshments on the course. The tournament has a total purse of $3,500 based on 35 teams; there are also prizes on par 3 holes and door prizes sponsored by local businesses. Over 100 local businesses, organizations, and donors support this annual event. All proceeds from the tournament benefit free outreach services for children with disabilities; pediatric developmental and preventative screenings; therapeutic recreation programs; child safety initiatives that prevent disabilities and fatalities from accidental injuries; and inclusive early learning programs which give young children a bright start to lifelong learning. To field a team, please contact Kirk Stauffer, PGA Pro, at 814-362-2005. Carts are an additional fee and can be reserved when registering a team. To learn more about tournament sponsorship opportunities, please contact Leslie Kallenborn at CARE for Children at 814-362-4621. June 28, 2018 – Rainbow Corner Preschool hosted an Early Learning Summer Program in June for preschool age children at the Ashley Booth Griffin CARE for Children Center in Bradford. The Preschool Day Camp, for children aged three to five years, focused on STEAM (Science, Technology, Engineering, Arts, and Math) activities and promoted Early Literacy. 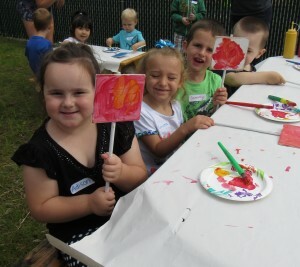 Six sessions held over three weeks focused on key early learning areas, fun activities, special programs, and outdoor play on CARE’s playground which was used as an outdoor classroom. This summer program was made possible through CARE’s partnership with the Bradford Area School District and an Early Childhood Education Innovation Zone grant as part of Pennsylvania’s federally funded Race to the Top Early Learning Challenge grant. 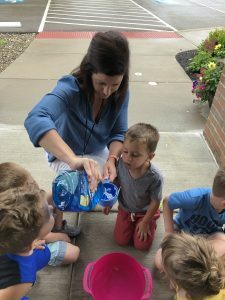 Pictured: Alexis Close, M.Ed., CARE early learning teacher, leads a science experiment on Thursday during CARE’s preschool summer day camp, while Emmett Callinan and other early learning campers watch closely. The students mixed different ingredients together to make bubbles. Callinan, age 3, is the son of Jeremy Callinan and Jessika Pearson of Bradford. 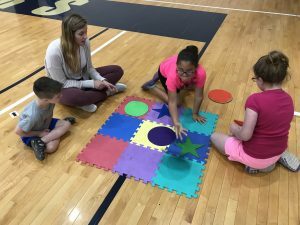 June 27, 2018 – CARE for Children’s Therapeutic Recreation Day Camp for children who receive school-based therapy services was recently held over three days at the University of Pittsburgh at Bradford Sports and Fitness Center. “Where in the world…” was the theme for this year’s Day Camp and activities focused on different World Cultures, exploring and adventure. During the camp, CARE kids took part in inclusive activities such as arts and crafts, swimming, story sessions, music, and gym sessions. “CARE’s Summer Day Camp gives our therapists and staff the opportunity to interact with our students in an informal setting and to work on gross and fine motor skills while having fun,” said Ashley Carlson, MOT, OTR/L, CARE for Children’s pediatric therapy services director. Summer day camp is one of the many therapeutic recreation programs that CARE offers each year, which serves as an extension of traditional therapy services and provides children with disabilities the opportunity to socialize, try new things, and the program hopes to promote life-long health and well-being. The camp is funded in part by the United Way of the Bradford Area, Inc.
Pictured, from left: Preston Taylor, Gina Kane, M.S., CCC-SLP, CARE speech/language pathologist, Maddelina Romero, and Delaney Bridge play a giant game of tic tac toe during CARE’s Therapeutic Recreation Day Camp at the University of Pittsburgh at Bradford on Wednesday. Taylor, age 6, is the son of Eric and Jennifer Taylor of Bradford; Romero, age 7, is the daughter of Santana Romero of Lewis Run; and Bridge, age 9, is the daughter of Josh and Erin Bridge of Bradford. 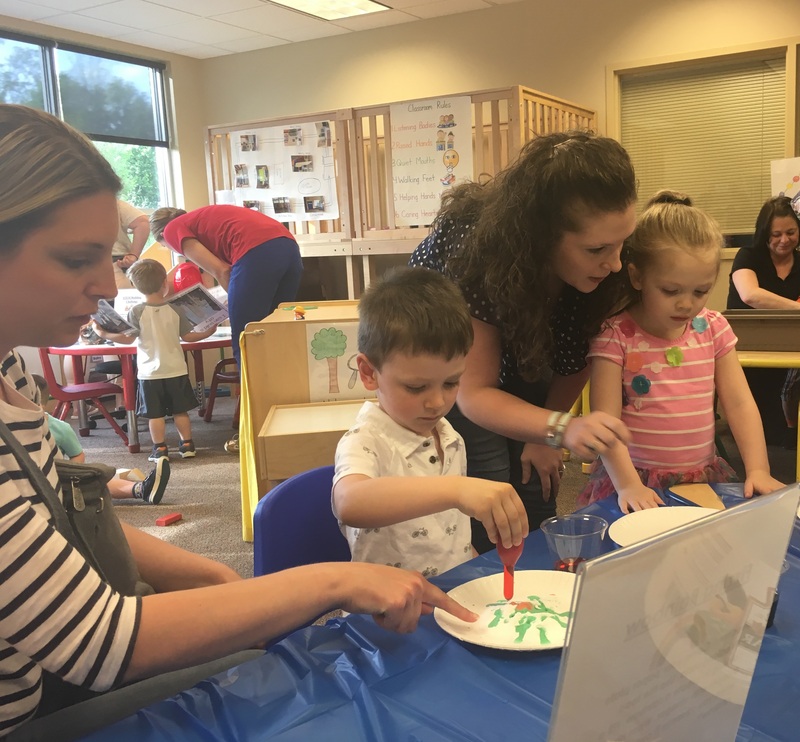 May 17, 2018 – Rainbow Corner Preschool hosted a Family Fun Night on Thursday evening for preschoolers and their families with hands-on activities that centered on science, technology, engineering and mathematics (STEM). Activities included building Lego and block structures, an experiment focused on sinking or floating, a color mixing activity, and an experiment using milk. 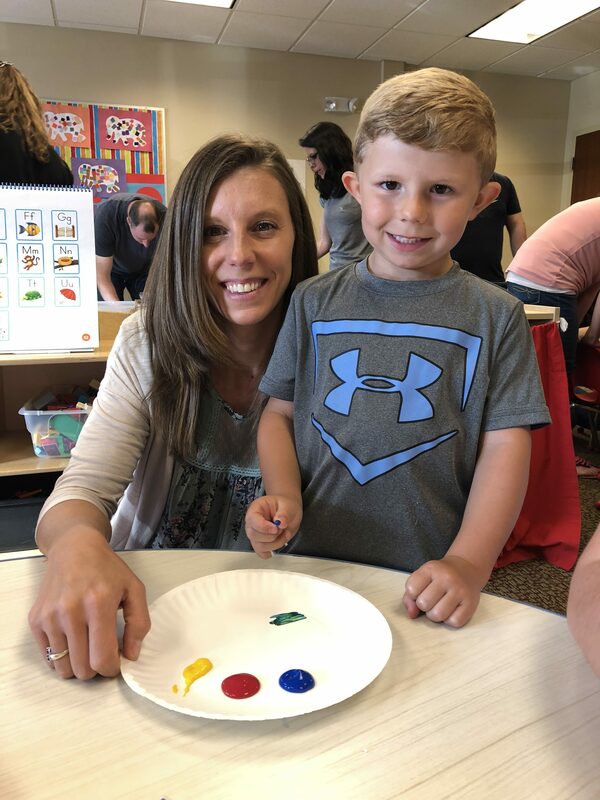 Pictured working together on a color mixing activity are Dara Haynoski with her son, Eli, age 4. The activity involved making predictions about mixing different colors together and then testing the theories. This program was made possible through CARE’s partnership with the Bradford Area School District and an Early Childhood Education Innovation Zone grant as part of Pennsylvania’s federally funded Race to the Top Early Learning Challenge grant. May 11, 2018 – CNB Wealth and Asset Management recently contributed $1,500 to CARE for Children to host a Business after Hours with the Bradford Area Chamber of Commerce on Thursday, May 31st from 5 pm to 7 pm at the Ashley Booth Griffin CARE for Children Center on East Main Street in Bradford. The event will coincide with the 5th Anniversary of the center and the completion of the capital campaign which supported the project; and is open to Chamber members and CARE for Children donors and supporters. Food is being catered by C.J.s Bar-B-Que while music will be provided by Tyler Calkins and Jim Copeland. Parking at the facility will be via Russell Boulevard. Yaros noted that CARE still has a little over $15,000 in outstanding pledges and any future funds collected or donations designated to the building fund will be used for improvements. “What is even more remarkable is the growth of the organization’s programs and services and the increase in number of children who are positively affected by therapy services, early learning, and the community outreach services CARE provides,” Martin added. RSVP’s for the CARE for Children Business after Hours are required by Thursday, May 24th by emailing reception@careforchildren.info or by calling CARE at 814-362-4621. Pictured: Joe Yaros, Vice President of Business Development at CNB Bank and CARE Board Treasurer; and Leslie Kallenborn, CARE Development & Marketing Coordinator are pictured in front of the Ashley Booth Griffin CARE for Children Center. April 19, 2018 – To mark The Week of the Young Child, Rainbow Corner Preschool held several activities to celebrate students in its early learning program. The theme for the week revolved around outer space and included lessons and activities about space, stars, planets, and astronauts. From left, Kandace Lonzi, age 5, Will Pantuso, age 5, Alyssa Hardy, Bradford Area High School CDA student, Anna Preston, age 5, and Kenleigh Johnson, age 4, are shown making moon sand earlier this week. 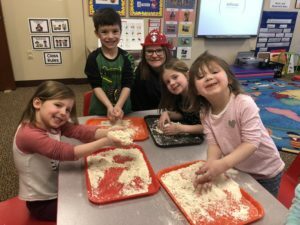 The students participated in a hands-on science experiment to make the sand out of flour and baby oil; and then enjoyed playing and sculpting with their creation. Other activities for the week included a classroom planetarium, constellation artwork, guest readers, yoga, and special space-themed snacks. CARE was able to feature STEM activities throughout the week through a partnership with the Bradford Area School District and an Early Childhood Education Innovation Zone grant as part of Pennsylvania’s federally-funded Race to the Top-Early Learning Challenge Grant. Lonzi is the daughter of Angela Carkin and Matthew Lonzi of Bradford; Pantuso is the son of Bill and Kendra Pantuso of Bradford; Preston is the daughter of Joshua and Megan Preston of Bradford; and Johnson is the daughter of Melissa Johnson of Bradford. The Week of the Young Child, an annual celebration sponsored by the National Association for the Education of Young Children (NAEYC), focuses public attention on the needs of young children and their families and recognizes the early childhood programs and services that meet those needs. April 3, 2018 – CARE for Children, a non-profit organization that provides services to children of all abilities, is offering a professional training, “Opioid Addiction and Exposure to Infants,” with Dr. Davina Moss-King, Ph.D. as presenter on Monday, May 7, 2018 at Beacon Light Behavioral Health Systems from 12:30 to 4:00 p.m. The training will provide and in-depth overview of opioid addiction and the biological effects for adults and infants; psychological effects of the exposure, including Reactive Attachment Disorder, that has a long-term effect on child development; and trauma in children as a result of opioid exposure. Participants will also learn to construct effective plans that support and enhance the development of the infant. Registration includes workshop materials and light refreshments. Participants will earn 3 infant-toddler training hours. Dr. Moss-King is the president and owner of Positive Direction and Associates, Inc. and has over 25 years of experience counseling individuals with substance use disorders. She graduated from the State University of New York at Buffalo with a Ph.D. in Counselor Education. As a New York State Credentialed Alcohol and Substance Abuse Counselor, a Certified Rehabilitation Counselor, and a National Credentialed Counselor, Dr. Moss-King has worked in the Western New York area in all areas of substance abuse treatment. Dr. Moss-King has published a one hour course sponsored by the World Continuing Education Alliance of the United Kingdom; published the book Unresolved Grief and Loss Issues Related To Heroin Recovery along with a Continuing Education course regarding women using opioids during pregnancy; and has published a chapter in the text book Substance Abuse and Treatment. 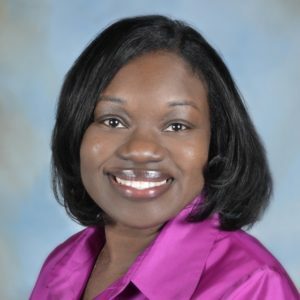 Dr. Moss-King is a member of the American Psychological Association and The National Neonatal Therapist Association. The professional training is sponsored by CARE for Children, McKean County Department of Human Services, and the United Way of the Bradford Area, Inc.
To register for the professional training, contact CARE for Children by phone at (814) 362-4621 or email at reception@careforchildren.info. The registration fee for the professional training is $10 per professional. There is no cost for McKean County Early Intervention Birth to 3 professionals. The registration deadline is May 1, 2018. March 20, 2018 – Northwest Bank recently made a $3,500.00 contribution to Rainbow Corner Preschool, which is part of CARE for Children. The preschool is an approved Pre-Kindergarten Scholarship Organization, through the State of Pennsylvania’s Educational Improvement Tax Credit Program (EITC). 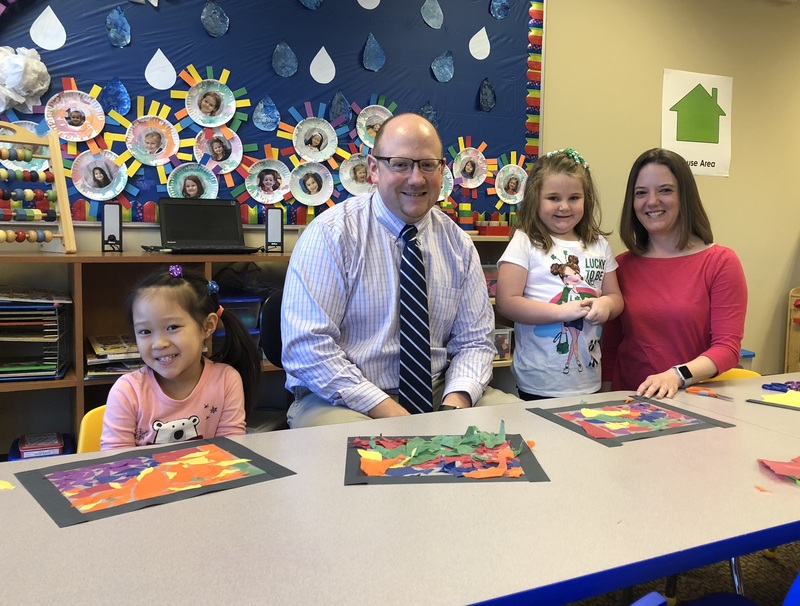 Norm Strotman, senior vice president, regional commercial lender at Northwest Bank, visited with Rainbow Corner Preschool students at the Ashley Booth Griffin CARE for Children Center on Tuesday. From left, Alexis Close, M.Ed., preschool teacher, and preschoolers Grace Zamberlan, Sena Noguchi, and Bentlee Confer are shown with Strotman. Zamberlan, 4, is the daughter of Jayson and Cheri Zamberlan of Bradford, Noguchi, 4, is the daughter of Yuko and Tomofumi Noguchi of Bradford, and Confer, 3, is the son of Amber Confer of Bradford. Contributions made through the EITC program help CARE provide tuition to eligible Pre-K students to attend preschool, making early learning more accessible and affordable for working families. Northwest Bank’s contribution will help fund scholarships for the 2018-2019 school year. Rainbow Corner Preschool is licensed by the Pennsylvania Department of Education and the daily schedule is aligned with Pennsylvania Early Learning Standards. For more information, please call CARE for Children at 814-362-4621 or visit the early learning page at www.careforchildren.info. March 19, 2018 – —Seneca Resources, the exploration and production segment of National Fuel Gas Company, has donated $2,100 to CARE for Children to purchase smoke detectors to distribute to families during McKean County Kids Fest. CARE for Children will be partnering with the Bradford City Fire Department to distribute the smoke detectors. At the event, families will receive fire safety educational materials, including a fire safety activity book with a home evacuation planning sheet and a free smoke detector with battery. 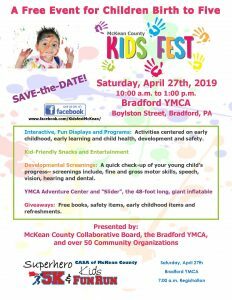 City Firefighters and Safe Kids Pennsylvania – McKean County Partner advisory council members will be on hand to distribute information and answer questions. 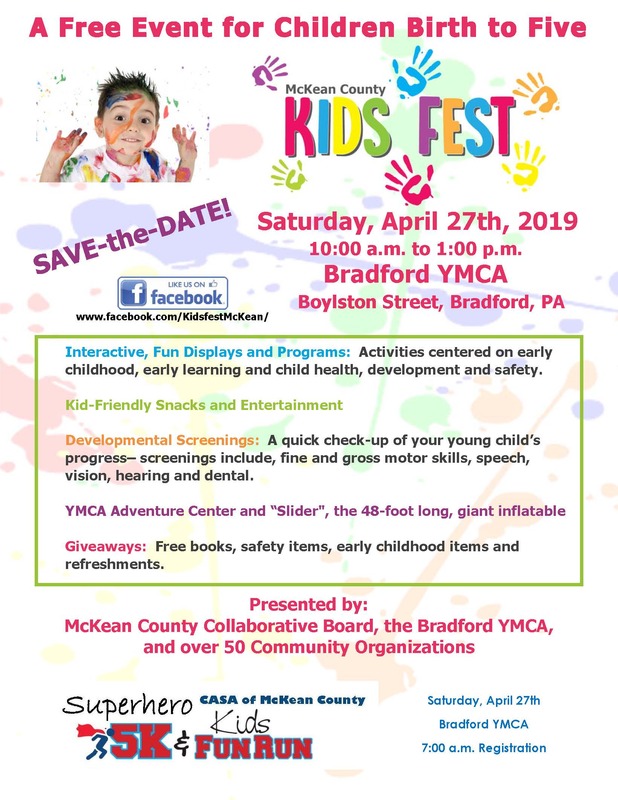 The sixth annual McKean County Kids Fest will be held on Saturday, April 28th from 10 a.m. to 1 p.m. at the Bradford Family YMCA. Kids Fest is a free community event, geared for children birth to age five and their families. The annual event promotes early learning, healthy child development, and child safety. 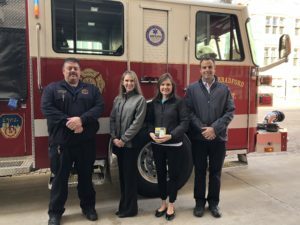 “We are very grateful for the gift we have received from Seneca Resources in support of CARE’s Child Safety and Injury Prevention program and the willingness of the Bradford City Fire Department to help distribute the smoke detectors at Kids Fest and educate families on the importance of this life-saving device, said Tina Martin, executive director at CARE. CARE for Children received additional funding from Safe Kids Pennsylvania to purchase smoke detectors for its Family Safety Item and Childproofing program for families in need. CARE for Children is a non-profit organization which provides child safety and injury prevention initiatives through its leadership of the Safe Kids Pennsylvania—McKean County Partnership which aims to promote the prevention of accidental child injuries through education, collaboration and advocacy. CARE also provides pediatric therapy services, early learning programs, and community outreach services for children of all abilities in the region. Seneca Resources Corporation, the exploration and production segment of National Fuel Gas Company, explores for, develops, and purchases national gas and oil reserves in California and Appalachia. Additional information about Seneca and National Fuel Gas Company is available at http://www.nationalfuelgas.com. Photo Caption: Pictured from left, Mike Campogiani, Bradford City Fire Department, Mandi Wilton Davis, executive director of the United Way of the Bradford Area and Safe Kids PA – McKean County Partner advisory council member, Ashley Carlson, MOT, OTR/L, CARE pediatric therapy services director, and Chief Eric Taylor are shown with a sample of the smoke detector that will be distributed to families at Kids Fest in April. The smoke detectors were made possible by a grant from Seneca Resources. March 19, 2018 – Preschool registration for the 2018-2019 school year is open for CARE for Children’s Rainbow Corner Preschool. The preschool is located in the Ashley Booth Griffin CARE for Children Center on East Main Street in Bradford. There are two sessions for children who are or will turn 3, 4, or 5: the three day-a-week program is offered on Tuesday, Wednesday, and Thursday from 8:00 – 11:00 a.m. and the five day-a-week program is offered Monday through Friday from 8:00 – 11:00 a.m. An extended care program is offered daily after preschool from 11:10 a.m. – 12:15 p.m., as needed and for an additional daily charge. 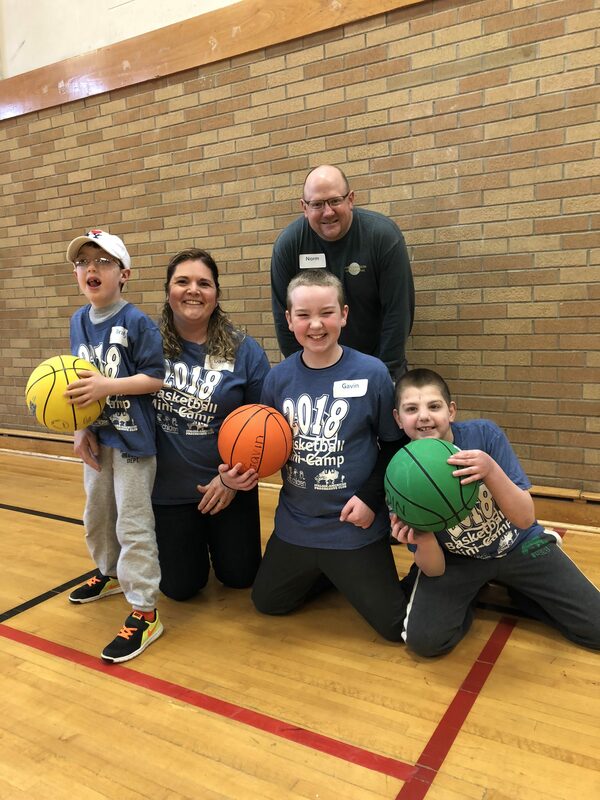 March 10, 2018 – CARE for Children’s 17th annual basketball mini-camp for school-age children was held Saturday at the Bradford Family YMCA. The camp provides the opportunity for both boys and girls of all abilities to work on gross and fine motor skills, socialization, and physical fitness. In addition to CARE’s therapists, teachers, and staff; volunteer coaches from the community were each paired with a team and the coaches worked with their team throughout camp. Campers visited skill stations which focused on different activities including passing, dribbling, shooting, layups, ball handling and defense; and children also participated in calisthenics and relays. Each child in attendance received a t-shirt and a basketball. After camp, lunch was hosted for campers and their family members at Hill United Methodist Church. T-shirts were sponsored by the Italian American Progressive Club and basketballs and lunch were sponsored by the Fraternal Order of Eagles. 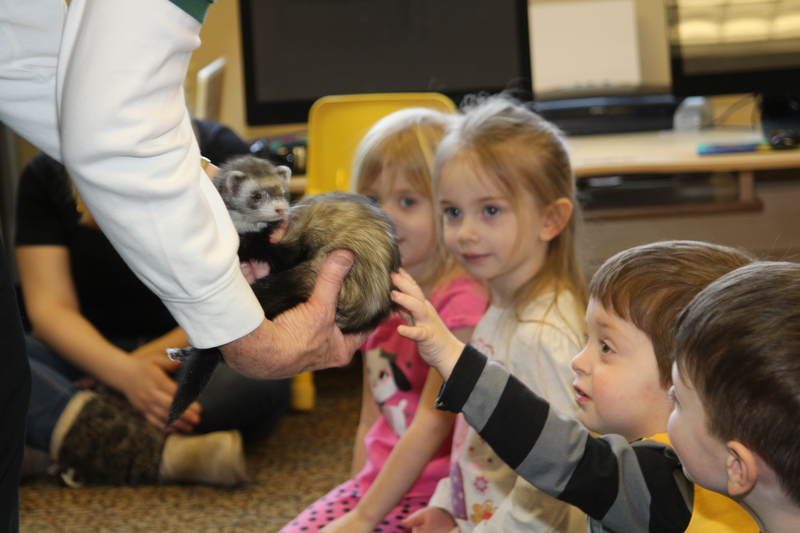 March 8, 2018 – The Erie Traveling Zoo visited Rainbow Corner Preschool on Thursday. The program, led by Amy Heisler, the zoo’s offgrounds coordinator, and Donna Christensen, volunteer educator, was called 1, 2, 3 Count With Me and revolved around the book “Mouse Count,” by Ellen Stoll Walsh. Rainbow Corner preschoolers listened to the story and practiced counting with five animal visitors including a ball python, chicken, lizard, Madagascar hissing cockroach, and tarantula. The students learned facts about each animal and practiced number concepts by counting the number of legs on each animal. The Erie Traveling Zoo enables students to go beyond the limits of a book and allows them to see, hear, and touch animals and artifacts while learning at the same time. 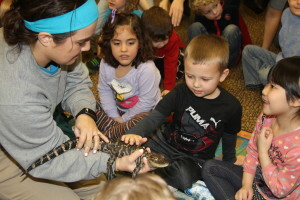 The zoo visit is incorporated into the STEM (Science, Technology, Math, and Science) curriculum at Rainbow Corner with zoo-themed activities, stories, and games. Pictured: Rainbow Corner Preschool student Gwyneth Neighbour gets a close look at “Hugo,” a ball python who is being held by Donna Christensen, volunteer educator at the Erie Zoo. Neighbour, age 4, is the daughter of Danny and Jill Neighbour of Bradford. 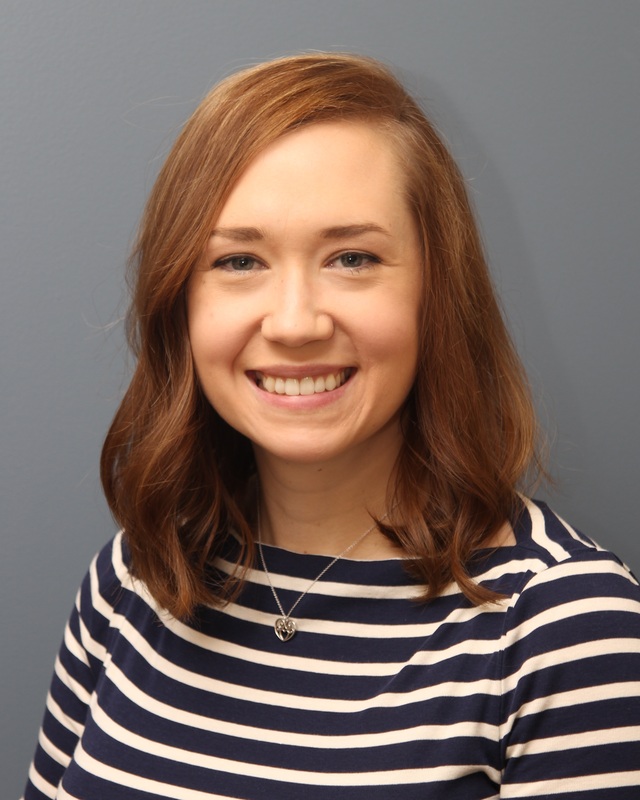 February 1, 2018 – Lauren Warmath, PT, DPT, joined the CARE for Children staff as a full-time Physical Therapist in December 2017. Warmath will provide physical therapy for the Early Intervention program (birth to three) in Warren and McKean Counties and services for school-based students in McKean County. “I am excited to join the team of CARE therapists where everyone is passionate about helping children of all ages and abilities,” said Warmath. 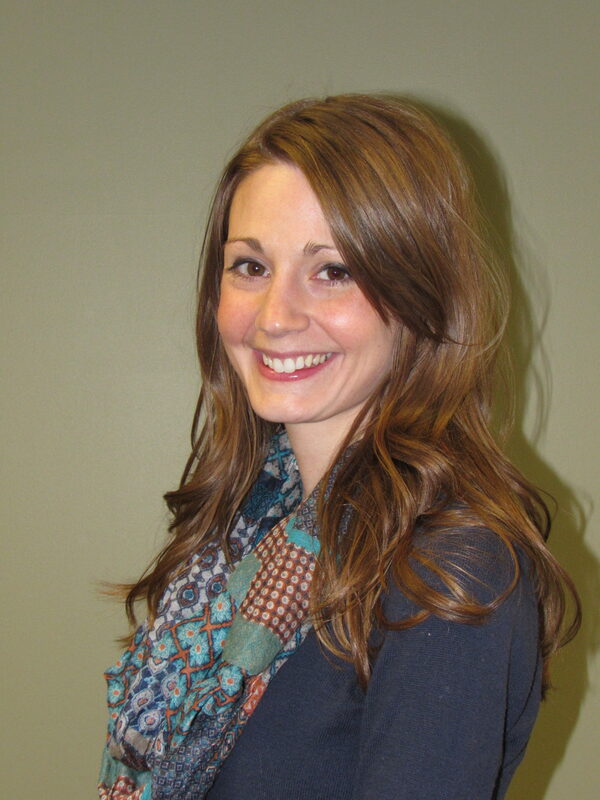 Warmath has five years of experience as a physical therapist. She most recently worked in an outpatient pediatric therapy clinic for three years, working with children ages birth to 18 years of age. She has worked with children with varying diagnoses, organized an adaptive dance class, and participated in aquatic therapy. Warmath graduated from Chatham University with a Doctor of Physical Therapy (DPT) degree and earned a Bachelor of Science degree in Exercise Science from Slippery Rock University. She resides in Warren with her husband and daughter. CARE for Children is a non-profit organization which provides pediatric therapy services, early learning programs, child safety and injury prevention initiatives, and community outreach services for children of all abilities in McKean County, Pennsylvania and the surrounding region. November 30, 2017 – The annual meeting of the CARE for Children Board of Directors was held Thursday evening at the Bradford Club. During a special presentation, Norm Strotman, CARE for Children Board President-Elect, announced that CARE is a recipient of the Pennsylvania Association of Nonprofit Organizations’ Seal of Excellence for successfully completing their rigorous Standards for Excellence® accreditation program. CARE for Children has been accredited through the Standards for Excellence program since 2002. This summer CARE submitted its third application for re-accreditation. A review by a jury of non-profit peers and the staff at PANO concluded that CARE complied with all 67 Standards and has again been awarded the Seal of Excellence as a visible symbol of a well-managed, responsibly governed organization. 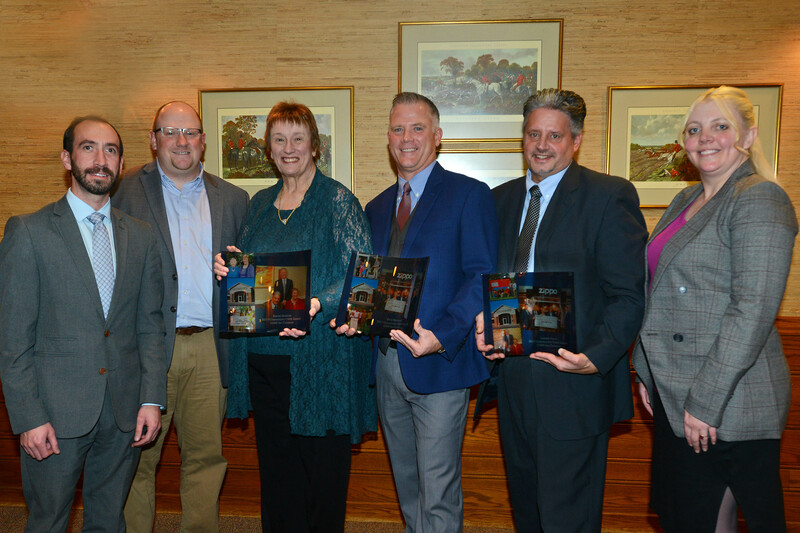 The CARE Board honored fellow board members Karen Gelston, Mick Marshall, and Joseph Yaros with the organization’s 2017 Community CARE Awards. Tina Martin, executive director, presented the three awards. The Community CARE Awards were established by the Board of Directors in 2003 to recognize outstanding contributions to the agency and to the children and families to whom CARE provides service. During the meeting, CARE Board President Karen Gelston, provided a review of CARE’s 2016-2017 fiscal year highlighting the organization’s establishment of formal vision and value statements, the ongoing success of the annual fund campaign, and the board’s adoption of a long-term sustainability plan. Gelston also recognized the new slate of officers including Strotman, Tyler Hannah, Vice-President-Elect, Joseph Yaros, Treasurer and Thomas E. Ball, Secretary who will begin two year terms as board officers, beginning in January 2018. The CARE Board recognized Alexis Close, M.Ed. for reaching five years of service at the organization. 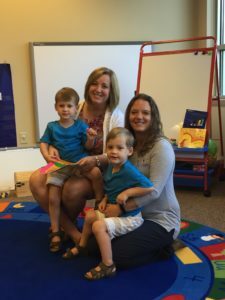 During her tenure at CARE, Close has worked as a preschool teacher and birth to three special instructor. Kimberly Engstrom, M.Ed., preschool director, presented Close with her milestone service award. November 9, 2017 – The CARE for Children Trailblazers wrapped up the fall season Thursday evening with a scrimmage against members of the Bradford Area High School Owls Soccer Teams. The scrimmage was followed by a pizza party for the team and their families. 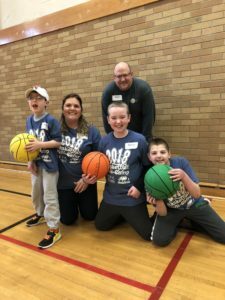 The Trailblazer program is an adaptive sports team for school-age children who receive CARE therapy services and who may have difficulty competing on a traditional team. The program is part of CARE’s therapeutic recreation program and goes beyond traditional therapy, providing an opportunity for physical fitness, improved self-esteem, socialization, and the experience of belonging on a team. Coach Matt Gilligan, physical education teacher at the Bradford Area School District, along with support from CARE therapists and staff, led the six-week Trailblazer soccer program. Team t-shirts are sponsored by Greg and Cherie Booth and Marshall Insurance Services, in memory of Ashley Booth Griffin. CARE for Children’s therapeutic recreation programs are funded in part by the United Way of the Bradford Area, Inc. and community donations. November 6, 2017 – The CARE for Children Board of Directors will host a reception as part of their annual meeting on Thursday, November 30th at 6:00 p.m. at the Bradford Club. Board Members, Karen Gelston, Mick Marshall, and Joseph Yaros will each be honored with a Community CARE Award to recognize their outstanding volunteerism, leadership and contributions to the organization throughout the planning, construction, capital campaign, and completion of the Ashley Booth Griffin CARE for Children Center. Yaros served two terms as Board President, from 2006 to 2010, during his tenure he led efforts to secure a new facility for the organization. When CARE purchased the property at 723 East Main Street, for the organization’s current facility, he was instrumental in forming a building committee that oversaw both the construction planning and development of a capital campaign to support the project. He chaired the committee throughout the project and completion of the facility. Yaros currently serves as the Treasurer of the Board of Directors and co-chair of the Building and Grounds Committee. Marshall followed as Board President, from 2010 to 2014, and provided leadership throughout the design of the building, with architectural firm R.W. Larson and Associates, the bidding process and engagement of a general contractor for the project and was active on the development team that met with businesses and key donors to support the project. Marshall currently serves on the Long Range Planning and Policy and Personnel Committees. Gelston successfully co-chaired, along with board member Deborah Price, CARE’s successful Building Campaign for the Future of Children of All Abilities. Gelston then followed Marshall as President of the Board of Directors, from 2014-2017, with her term to end on December 30th. 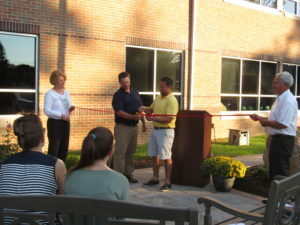 During her tenure, CARE completed the final phases of the building project including the playground, extensive landscaping and the completion of the Lena Graham Griffin Memorial Garden. Gelston had also served as Board President in fiscal year 2005-2006. She is the long-time chair of the Policy and Personnel Committee. The Board will also honor CARE Preschool Teacher and Special Instructor, Alexis Close, who has reached 5 years of service to the organization. The cocktail reception will feature heavy hors d’oeuvres and a cash bar. Following the program, guitarist Jim Ronan will perform. Reservations for the annual meeting will be accepted through Wednesday, November 22nd, and can be made by calling the CARE office or by emailing reception@careforchildren.info. The cost is $25 per person. Photo Caption: Pictured are CARE Board Members and Community CARE award recipients, Joseph Yaros and Karen Gelston (seated) and Mick Marshall (standing). Yaros, Gelston, and Marshall will each be honored in recognition of their outstanding volunteerism, leadership and contributions to the organization throughout the planning, construction, capital campaign, and completion of the Ashley Booth Griffin CARE for Children Center at the Annual Meeting of the CARE for Children Board of Directors on November 30th. September 15, 2017 – Safe Kids Pennsylvania-McKean County Partner and CARE for Children are providing car seat safety checks, by a certified technician, on Wednesday, September 20th from 10:30 a.m. – 1:00 p.m. at the Ashley Booth Griffin CARE for Children Center at 723 East Main Street in Bradford. The safety checks are part of National Child Passenger Safety Week which is held annually in September. Appointments are requested but not necessary. To schedule a time call CARE at 362-4621. According to the National Highway Traffic Safety Administration, car crashes are a leading cause of death for children 1 to 13 years old, and every 33 seconds, one child under the age of 13 is involved in a crash. Many deaths and injuries can be prevented by correct use of car seats, boosters and seat belts. When installed and used correctly, child safety seats can prevent injuries and save lives; child safety seats can reduce fatal injury by up to 71 percent (Safe Kids Worldwide). For the best possible protection a child must be rear-facing until age 2 in a rear-facing infant or convertible seat. Children who ride in rear-facing seats have the best protection for the head, neck and spine. Never place a rear-facing car seat in front of an active air bag. A child in a forward-facing seat must be at least 2 years old and meet the manufacturer’s minimum height and weight. Children should ride in forward-facing child safety seats with a harness, in the back seat, as long as possible. Once children outgrow their forward-facing seats, they should ride in belt positioning booster seats, in the back seat. Children from about age 4 to at least age 8 must be placed in a booster seat unless 4’9” tall. The booster seat can only be used with the vehicle lap and shoulder belt. Seat belts fit properly when the lap belt lays across the upper thighs and the shoulder belt must be adjusted so it crosses the center of the shoulder and chest. If possible, children should continue to use a booster seat if their knees do not bend over the front edge of the vehicle seat when the child is sitting properly with back touching the seat cushion. When children outgrow their booster seats, (at least eight years of age or when they are 4’9” tall) they can use the safety belts in the back seat, if they fit properly (lap belt lays across the upper thighs and the shoulder belt fits across the center of the shoulder and chest). Remember: All children younger than age 13 should ride in the back seat. August 10, 2017 – PNC Bank recently made a $2,500 contribution to CARE for Children, an approved Pre-Kindergarten Scholarship Organization, through the State of Pennsylvania’s Educational Improvement Tax Credit Program (EITC). Contributions made through the EITC program help CARE provide scholarships to eligible Pre-K students to attend CARE’s inclusive preschool, Rainbow Corner, located at the Ashley Booth Griffin CARE for Children Center in Bradford. These scholarships make learning more accessible and affordable for working families. Barbara Kervin, Branch Manager, at PNC Bank in Bradford (back left), recently visited Rainbow Corner Preschool to meet with Preschool Director, Kimberly Engstrom, M.Ed. and students, Alec and Isaac Morrisroe, who will attend Rainbow Corner Preschool this fall. Alec and Isaac, age 3, are the twin sons of Dennis and Dawn Morrisroe of Bradford. August 9, 2017 – Pine Acres Country Club hosted CARE for Children’s Adaptive Golf Outing for children of all abilities on Wednesday morning. 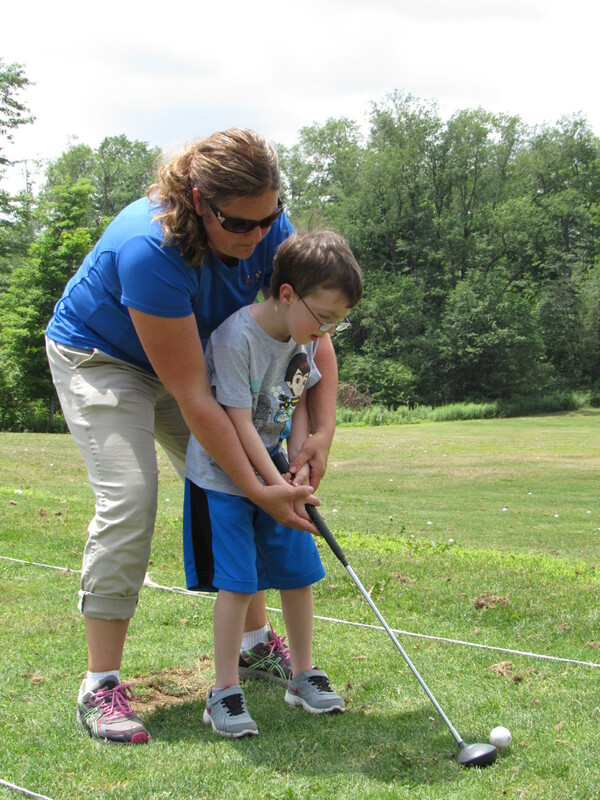 Pictured is CARE physical therapist Dana Pence, who is helping Noah Lynch, age 7, on the driving range. Noah is the son of Ryan and Kate Hildebrandt of Port Allegany. Sixteen children ages 6 to 16 hit on the driving range, practiced on the putting green and hit balls on the course under the volunteer instruction of PGA pro Kirk Stauffer. August 6, 2017 – Premier and Lead Sponsors, Allegheny Bradford Family of Companies, Philo & Sarah Blaisdell Foundation, Highmark Blue Cross Blue Shield, and Zippo/Case Museum, presented this year’s CARE ‘fore’ Children golf tournament, which raised over $22,000. All proceeds benefit CARE’s free community outreach services for children with disabilities; pediatric developmental and preventative screenings; therapeutic recreation programs; child safety initiatives that prevent disabilities and fatalities from accidental injuries; and inclusive early learning programs. CNB Bank, Marshall Insurance Services, and Kids & Cancer Benefit were flight sponsors. Eight other businesses sponsored half-flights, including Aetna, Greg and Cherie Booth, Carlson Dental Associates, Bob Cummins Construction Company, Italian American Progressive Club, Northwest Savings Bank, Sundahl & Company Insurance and Shults Toyota. In total, over 140 donors, businesses and organizations provided sponsorships and in-kind donations of prizes and other services to support the tournament. Thirty teams comprised of 120 golfers made up the field. 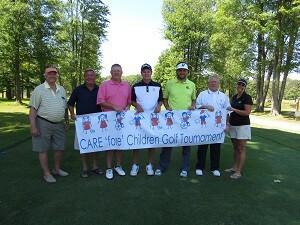 Photo Caption: The team of Matt Monago, Boo Coder, Brian Larson, and Pete Pascarella shot a score of 58 to win the Kids & Cancer Benefit flight at the 24th annual CARE ‘fore’ Children golf tournament Sunday at Pine Acres Country Club. 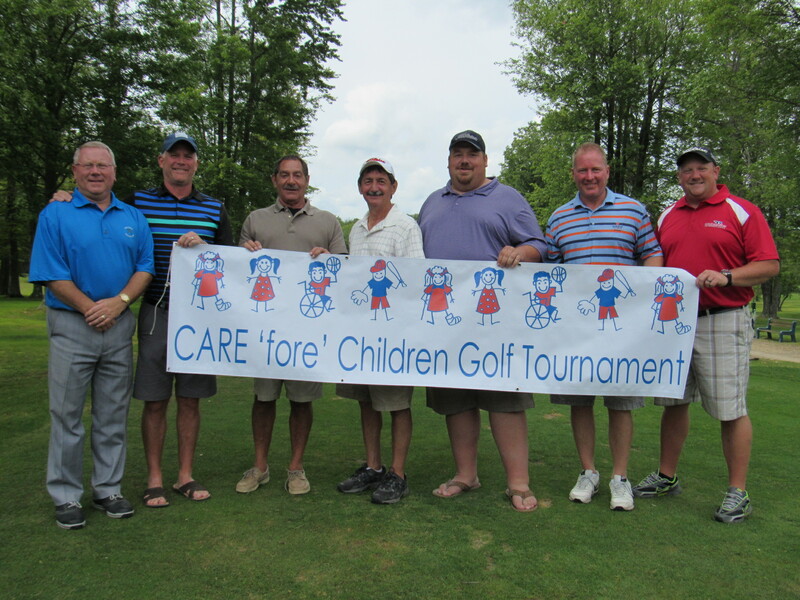 Pictured from left are Kirk Stauffer, Pine Acres pro; Mick Marshall, CARE board member and tournament co-chair; Pete Pascarella, Boo Coder, Matt Monago, Brian Larson, and Norm Strotman, CARE board member and tournament co-chair. 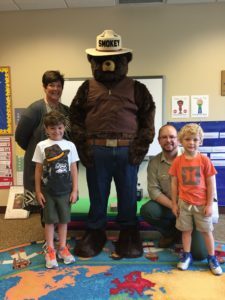 June 22, 2017 – Rainbow Corner Preschool, part of CARE for Children, had a special visit from Smokey the Bear on Thursday at the Ashley Booth Griffin CARE for Children Center. Joshua Bridge, forest ranger with the Allegheny National Forest, read the students the “Story of Smokey,” discussed ways to help prevent wildfires, and campfire safety. Smokey and Bridge also visited CARE for Children’s Therapeutic Recreation Summer Day Camp for school-age children at the University of Pittsburgh at Bradford later in the day. Pictured with Smokey the Bear are preschoolers Paul Luzzi and Robbie Cathers, along with Jan Stiles, CARE preschool aide and Joshua Bridge, forest ranger. Luzzi, age 5, is the son of Sal and Shannon Luzzi of Bradford and Cathers, age 4, is the son of Robert and Tara Cathers of Bradford. June 15, 2017 – Northwest Bank recently made a $3,000.00 contribution to Rainbow Corner Preschool, which is part of CARE for Children. The preschool is an approved Pre-Kindergarten Scholarship Organization, through the State of Pennsylvania’s Educational Improvement Tax Credit Program (EITC). Norm Strotman, senior vice president, regional commercial lender at Northwest Bank, visited with Rainbow Corner Preschool Summer Day Camp students at the Ashley Booth Griffin CARE for Children Center on Thursday. 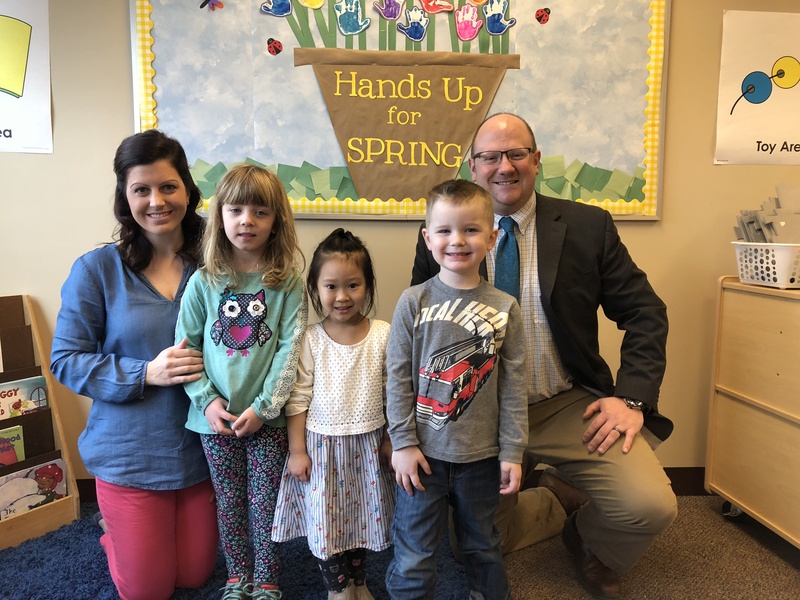 From left, preschoolers Cameron Butler, Adilyn Getz, and Anna Preston are shown with Strotman and Kimberly Engstrom, M.Ed., preschool director. Butler, 4, is the son of Jim and Stephanie Butler of Bradford, Getz, 4, is the daughter of Robert and Deanna Getz of Lewis Run, and Preston, 4, is the daughter of Joshua and Megan Preston of Bradford. Contributions made through the EITC program help CARE provide tuition to eligible Pre-K students to attend preschool, making early learning more accessible and affordable for working families. Northwest Bank’s contribution will help fund scholarships for the 2017-2018 school year. May 25, 2017 – CARE for Children, the lead agency for Safe Kids Pennsylvania – McKean County Partner, joined together with the Bradford Area School District and the United Way of the Bradford Area, Inc. this week to properly fit 197 Kindergarten students with free bicycle helmets. “The goal of the program is to promote helmet use at an early age and to encourage parents to reinforce their child’s use of these injury preventing devices,” according to Tina Martin, executive director at CARE. On Friday, Kimberly Engstrom, M.Ed., CARE preschool director and bike safety educator, talked to Kindergarten students at George G. Blaisdell Elementary School about bicycle safety and the importance of wearing helmets. She read the book Play it Safe, by Mercer Mayer, which helped reinforce safety tips such as wearing bright colors; using hand signals; watching for traffic lights and stop signs; avoiding wet leaves, puddles, rocks, and cracks in the road; and always wearing a helmet. Engstrom also demonstrated how to properly wear a helmet and fasten the chin strap. “Bicycle helmets are the best protection against head and brain injury, and a helmet is most effective when fit properly. When parents reinforce helmet use; children are more likely to use this injury preventing safety item,” Engstrom added. Students also received an identification sticker for parents to complete and place inside the helmet for emergency contact information. According to Safe Kids Worldwide, nearly 50 children an hour visit emergency departments with an injury related to bikes, scooters, skates or skateboards. Properly fitted helmets can reduce the risk of head injury by at least 45 percent; however, less than half of children age 14 and under usually wear a bike helmet. Pennsylvania’s mandatory bicycle helmet law requires children under age 12 must wear a helmet while riding a bicycle, or while a passenger in a bicycle restraining seat or trailer. Children’s toys known as “big wheels” are excluded. The bike helmet law is intended to encourage children to wear helmets. People cited for violating the law will have their citation dismissed if they buy a helmet. CARE for Children will fit children with bike helmets by appointment. Parents can call the agency at 814-362-4621 or by email at reception@careforchildren.info. Safe Kids Pennsylvania – McKean County Partner is a collaborative effort of local organizations, businesses, and individuals who support child safety and injury prevention efforts targeted to local needs. CARE for Children provides the leadership and fiscal oversight and support of the program. For more information go to www.careforchildren.info. Photo Caption: Kimberly Engstrom, at left, of CARE for Children, fits a bicycle helmet on a Kindergarten student at GGB Elementary School. 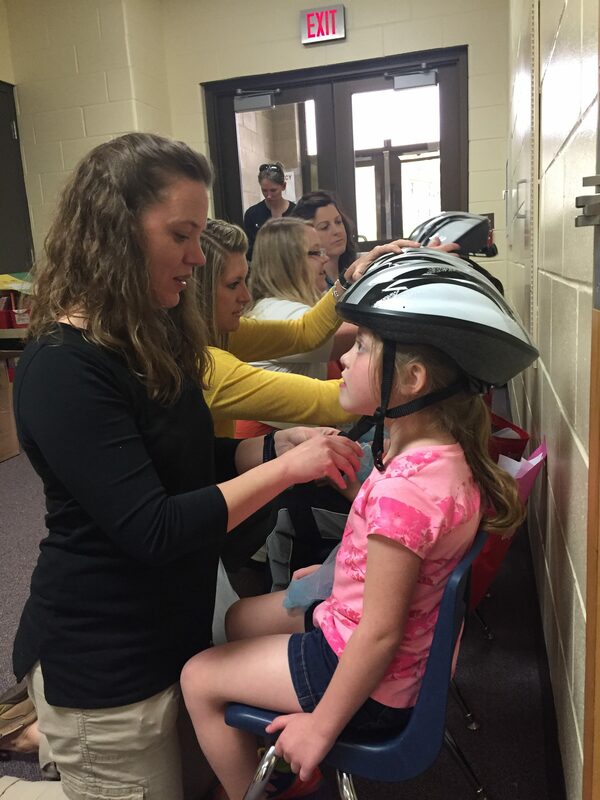 Also shown assisting with helmet fittings are CARE staff Kylie Atteberry, Miranda Nichols, and Alexis Close. 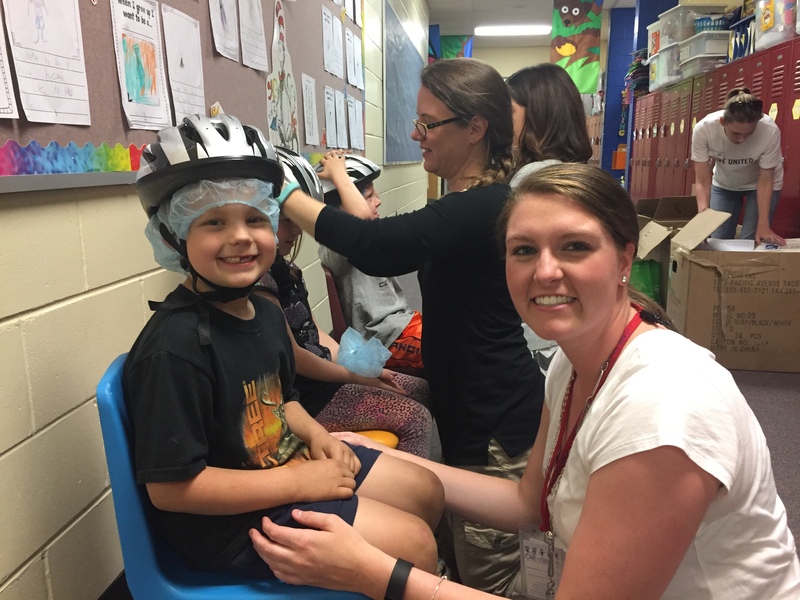 Throughout the week, 197 Kindergarten students in the Bradford Area School District were properly fit with free bicycle helmets through United Way funding. May 24, 2017 – Rainbow Corner Preschool hosted a Family Fun STEM Night on Tuesday evening for preschoolers and their families with hands-on activities that centered on science, technology, engineering and mathematics (STEM). Activities included building Lego replicas of structures, making pennies float in handmade boats, using blocks to build roads and bridges, and planting herbs. An ice cream sundae party on the playground finished the evening. 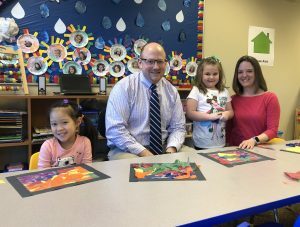 Pictured from left, Lindsay Crappio with her son, Brock Crappio, age 3, and Jackie Carlson with her daughter, Abby Carlson, age 4, work on a “Fizzy Rainbow” science experiment with baking soda, food coloring and vinegar. Rainbow Corner Preschool, located at the Ashley Booth Griffin CARE for Children Center, is an inclusive developmental program for children ages 3 to 5 years old and also hosts a toddler developmental playgroup for children ages 24 to 42 months of age. For more information visit www.careforchildren.info. May 16, 2017 – CARE for Children, a non-profit organization that provides services to children of all abilities, is offering a professional training to address Infant Mental Health with Erin Troup LPC, NCC, CT as presenter on Wednesday, June 14, 2017 at the University of Pittsburgh Bradford from 8:45am to 3:30pm. The workshop will introduce the basic principles of infant and early childhood mental health, and will focus on brain development and social emotional development from birth to five. Other topics include: critical periods of development; barriers to social and emotional growth, and information on maintaining a trauma-informed practice. The professional training will be geared for Early Intervention Professionals and Therapists; Social Workers; Educators; Para-professionals; professionals who work with the birth to five population and mental health professionals. Registration includes workshop materials, lunch and light refreshments. Participants will earn 6 infant-toddler training hours, 6 Act 48 hours or 6 Social Work CEUs. Erin Troup is a Licensed Professional Counselor specializing in early childhood social emotional needs, particularly attachment, grief and loss, trauma and anxiety. She earned her undergraduate degree in psychology and child development from Indiana University of Pennsylvania. She attended Chatham University for her MS in counseling and earned her Infant Mental Health Certificate in Pennsylvania’s first Infant Mental Health cohort. Troup has worked in the fields of Mental Health, Early Intervention and Behavioral Health services for over 15 years. Most recently in 2013, she opened her private practice, Sprout Center for Emotional Growth and Development, LLC. She has presented on a variety of topics including mental health, grief and loss, social emotional and child development throughout the United States. Troup is also the board secretary for The Pennsylvania Association for Infant Mental Health and a member of The Association for Death Education and Counseling. The Infant Mental Health professional training is sponsored by the United Way of the Bradford Area, Inc., McKean County Department of Human Services, and the University of Pittsburgh Bradford Social Work Program. To register for the professional training, contact CARE for Children by phone at (814) 362-4621 or email at reception@careforchildren.info. Registration fees for the professional training are $50 per professional or $25 for McKean County Early Intervention providers. The registration deadline is Wednesday, June 7, 2017. April 27, 2017 – To mark The Week of the Young Child, Rainbow Corner Preschool held several activities to celebrate students in its early learning program. On Thursday, preschoolers had the opportunity to learn about the Bradford Area Public Library with a presentation by Lacey Love, executive director of the library. Love read the book Chicken Story Time, by Sandy Asher, a silly book about a story hour that is taken over by chickens. She also talked to the preschoolers about the library and story hour. On Wednesday, preschoolers enjoyed a camping-themed day. They wore their favorite camping gear to school, made s’mores, read We’re Going on a Bear Hunt, by Michael Rosen, and participated in their own classroom bear hunt. Other highlights from the week included lessons revolving around “I Spy” which included sound and letter recognition and object identification. Each child received an “I Spy” hidden picture book to take home. The Week of the Young Child, an annual celebration sponsored by the National Association for the Education of Young Children (NAEYC), focuses public attention on the needs of young children and their families and recognizes the early childhood programs and services that meet those needs. The theme for the week is Early Years Are Learning Years. Rainbow Corner Preschool is part of CARE for Children. For more information on Rainbow Corner or CARE for Children, visit www.careforchildren.info. 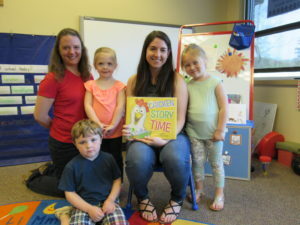 Photo Caption: Rainbow Corner Preschool students (l-r) Ezra Bockmier, Abby Carlson and Madilynn Brown are shown with Kimberly Engstrom, M.Ed., preschool director, and Lacey Love, executive director of the Bradford Area Public Library. Love visited the preschool on Thursday to read Chicken Story Time. Bockmier, age 4, is the son of Jeff and Erin Bockmier of Olean, NY; Carlson, age 3, is the daughter of Michael and Jaqueline Carlson of Bradford; and Brown, age 3, is the daughter of Danielle Brown of Bradford. April 5, 2017 – CARE for Children and McKean County Early Intervention providers are hosting an Early Learning program on Thursday, April 6th at 4:30 p.m. at the Eldred Area Free Library. The program, “Early Learning Fun and Sign Language for Kids,” is geared for children, birth to 5 years of age. Parents and children will learn simple signs that follow along with the book From Head to Toe, by Eric Carle. Children will also participate in gross motor and fine motor activities. Each family attending will receive a copy of the book and other helpful materials. The program is free and open to parents and children. March 25, 2017 – Thirty-five children attended CARE for Children’s 16th annual basketball mini-camp on Saturday at the Bradford Family YMCA. The camp provides the opportunity for both boys and girls of all abilities to work on gross and fine motor skills, socialization, and physical fitness. Pictured with CARE therapist, Melanie Rendos, B.S., COTA/L, is Noah Lynch, age 7, a first grader at Port Allegany Elementary School. “Each year the CARE Basketball Mini Camp is one of the most highly anticipated therapeutic recreation programs on our schedule. Campers are able to learn about the game in an inclusive environment and have fun with the CARE staff and their friends,” said Ashley Carlson, MOT-OTR/L, CARE for Children’s Pediatric Therapy Services Director. Each child in attendance received a t-shirt and a basketball. T-shirts were sponsored by the Rotary Club of Bradford. After camp, lunch was hosted for campers and their family members at Hill United Methodist Church. March 20, 2017 – CARE for Children’s Rainbow Corner Preschool and Toddler Developmental Playgroup, both located at the Ashley Booth Griffin Center, East Main Street, Bradford, are accepting registrations for the 2017-2018 school year. Rainbow Corner Preschool is currently registering children who are or will turn 3, 4, and 5. There is a 3 day program which is offered on Tuesday, Wednesday, and Thursday from 8:00 – 11:00 a.m. and a 5 day program which is offered Monday through Friday from 8:00 – 11:00 a.m. An extended care program is offered daily after preschool from 11:10 a.m. – 12:15 p.m., as needed and for an additional daily charge. The playgroup is available for children 24-42 months of age. The playgroups, which are held Monday and Friday from 8:30 – 10:30 a.m., focus on social interaction, language development, and age-appropriate structured play. Children may attend one or both playgroups. For more information, please call CARE for Children or visit www.careforchildren.info. February 28, 2017 – CARE for Children, in partnership with the YMCA of the Twin Tiers, is offering a free therapeutic aquatic program beginning Monday, March 6th at the Bradford Family YMCA pool from 4:30 p.m. to 5:00 p.m.
Aquabilities is an adaptive therapy-based program for children, ages 6 months through preschool age, and geared for those who receive therapy services through Early Intervention and/or require professional therapeutic programming to develop physical, social and emotional skills. This is not a swim program or swimming lessons. The sessions will be led by CARE therapists; and members of the CARE staff and YMCA Aquatic Staff will also be on hand. Parents will learn therapeutic techniques and exercises in the pool to help their child have fun and reach developmental goals. Since this is a family-centered activity: a parent, guardian or a responsible, designated adult is required to participate and assist his or her child in the locker room and in the pool. Sessions will be held on Mondays; March 6th, 13th, 20th, and 27th. Space is limited. Advance registration is required by Friday, March, 3rd, by contacting CARE for Children at 814-362-4621. February 22, 2017 – The Erie Traveling Zoo visited Rainbow Corner Preschool on Wednesday. The program, led by Amy Heisler, the zoo’s offgrounds coordinator, and Donna Christensen, volunteer educator, revolved around animal movement. Rainbow Corner preschoolers visited with four animal visitors including a box turtle, collared dove, chinchilla, and ferret. The students learned facts about each animal and talked about their unique movements. Following the program, preschoolers moved along to music to mimic animal movements. The Erie Traveling Zoo enables students to go beyond the limits of a book and allows them to see, hear, and touch animals and artifacts while learning at the same time. The zoo visit is incorporated into the curriculum at Rainbow Corner with animal activities, stories and games. February 20, 2017 – CARE for Children held its annual Adaptive Ski Outing at Holiday Valley Ski Resort on Monday, with nine children in attendance. Each child was paired with one or more volunteer instructors and given expert instruction as part of the Holiday Valley Lounsbury Adaptive Ski Program, which is a chapter of Disabled Sports/USA. Pictured is Nick Barker, age 10, along with volunteer Lounsbury Adaptive Ski Program instructors Bob Bredenberg and Kris Segeti. Barker is the son of Shery Barker of Bradford. The ski outing was sponsored by the Rotary Club of Port Allegany. Lunch and skiing were provided by the Lounsbury Adaptive Ski Program and Todd Busses donated transportation to and from Ellicottville, N.Y.
January 15, 2017 – Lindsey Hnath, M.S., CCC-SLP, has joined the CARE for Children staff as a full-time Speech-Language Pathologist. Hnath graduated with a Master’s of Science in Speech-Language Pathology from Clarion University of Pennsylvania in 2011 and a Bachelor of Science in Communication Disorders from California University of Pennsylvania in 2009. She resides in Wilcox with her husband and daughter. The annual meeting of the CARE for Children Board of Directors was held Thursday evening at the Bradford Club. 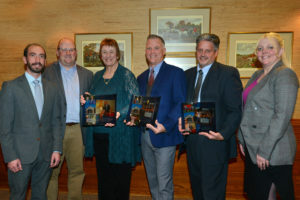 The CARE Board of Directors honored Greg and Cherie Booth with the organization’s Community CARE Award. Tina Martin, executive director, and Mick Marshall, past president of the CARE Board of Directors, presented Mr. and Mrs. Booth with the award. 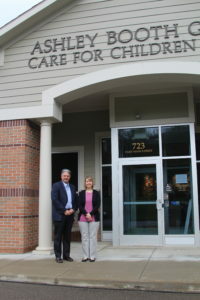 “More than their dedication to the building project and the Ashley Booth Griffin CARE for Children Center, Greg and Cherie have become true and vocal advocates for CARE’s mission and continue to be avid supporters of our programs and services,” added Martin. 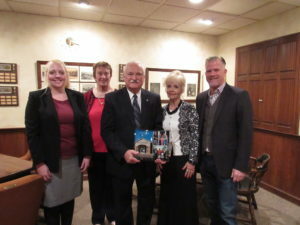 In addition to the Community CARE Award, the board of directors and the many friends of Mr. and Mrs. Booth have designated a room in the Ashley Booth Griffin CARE for Children Center in their honor and a tile plaque will be placed in the building as a constant reminder of their outstanding support of the organization. During the meeting, CARE Board President Karen Gelston, provided a review of CARE’s 2015-2016 fiscal year. “During the fiscal year, CARE has worked to stabilize funding streams and for the first time in 92 years exceeded $1 million dollars in operating revenues which was independent of capital campaign funds,” noted Gelston. CARE Board Development Chair, Deborah Price recognized fellow board member Scott Bayline for his longstanding and dedicated service to the organization. Bayline has served three consecutive terms on the CARE board of directors and will be completing a nine year tenure in December. New board member, Fred Graham, will begin a three-year term in January 2017. The CARE Board also honored employees who have reached milestone years of service at the organization. Tom Ball, board secretary, recognized Tina M. Martin, executive director, for her 15 years of service, including 10 years as executive director. Other staff reaching milestones included Ashley Carlson, MOT, OTR/L, pediatric therapy services director, 10 years; Ann Kane, PT, physical therapist, 5 years; and Melanie Rendos, B.S., COTA/L, occupational therapy assistant and special instructor, 5 years. Pictured honoring Greg and Cherie Booth, middle, with the Community CARE Award are Executive Director Tina Martin, far left, CARE Board President Karen Gelston, second from left, and Past President of the CARE Board of Directors Mick Marshall, far right. September 22, 2016 – Lena’s Garden, in memory of Lena Graham Griffin, was dedicated during a ribbon cutting ceremony on Thursday evening at the Ashley Booth Griffin CARE for Children Center. The new memorial garden features a walkway, plantings, and seating. The garden is located on the Russell Boulevard level of the building near the preschool entrance. Mrs. Griffin began her tenure at CARE (formerly the McKean County Society for Crippled Children) in 1949 as an orthopedic nurse and in 1950 was named executive secretary/director. During her leadership at the Society, Mrs. Griffin witnessed many changes in the treatment of children with disabilities; as the era of polio, heavy braces, iron lungs, segregation and hopelessness, gave way to new preventives, new treatments, new attitudes, and new hope for children with disabilities. Mrs. Griffin retired January 1st 1970, with over twenty years of service to the Society. After her retirement, she continued to volunteer her nursing skills on clinic days working with children of the community. “Tonight we had a wonderful opportunity to further recognize Lena Graham Griffin and her incredible commitment to children in need,” said Greg Booth, vice president of the CARE board of directors. “As a result of the continued support of the Graham family and their generosity we dedicated ‘Lena’s Garden’, giving us a permanent memorial to Lena’s leadership, professionalism and compassion. Her love for ‘our kids’ ultimately led to CARE for Children and the amazing work we do here in Bradford at the Ashley Booth Griffin Care for Children Center,” said Booth. September 18, 2016 – Safe Kids Pennsylvania-McKean County Partner and CARE for Children are providing car seat safety checks, by a certified technician, on Tuesday, September 20th from 11:00 a.m. – 1:00 p.m. at the Ashley Booth Griffin CARE for Children Center at 723 East Main Street in Bradford. The safety checks are part of Child Passenger Safety Week which is held annually in September. Appointments are requested but not necessary. To schedule a time call CARE at 362-4621. Road injuries are the leading cause of preventable deaths and injuries to children in the United States. When installed and used correctly, child safety seats can prevent injuries and save lives; child safety seats can reduce fatal injury by up to 71 percent (Safe Kids Worldwide). A child in a forward-facing seat must be at least 2 years old and meet the manufacturer’s minimum height and weight. Children should ride in forward-facing child safety seats, in the back seat, as long as possible. August 7, 2016 – Tournament Sponsor, Zippo/Case Museum, presented the twenty-third annual CARE ‘fore’ Children Golf Tournament on Sunday. The event raised over $19,000 and all proceeds benefit CARE’s free community outreach services for children with disabilities; pediatric developmental and preventative screenings; therapeutic recreation programs; child safety initiatives that prevent disabilities and fatalities from accidental injuries; and inclusive early learning programs. Lead Sponsorship was provided by The Philo & Sarah Blaisdell Foundation, Allegheny Bradford Family of Companies, and Highmark. CNB Bank was a Flight Sponsor and 8 other business sponsored Half-Flights, including Bob Cummins Construction Company, Carlson Dental Associates, Kessel Construction, Inc., Marshall Insurance Services Inc., Northwest Savings Bank, Santo Vida- Natural Wellness Center, Sundahl & Company Insurance and Shults Toyota. In addition over 136 donors, businesses and organizations provided Par 3, Tee, Patron, and Friend Sponsorships and in-kind donations of prizes and other services to support the tournament. Thirty teams comprised of 120 golfers made up the field. CARE for Children is a non-profit organization dedicated to improving the lives of children of all abilities. 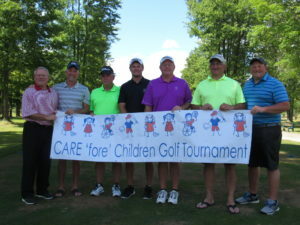 Photo Caption: The team of Keith Stauffer, Jeff Burgess, Josh Stauffer, and Mike Cercone shot a score of 56 to win the CNB Bank Flight at the 23rd annual CARE ‘fore’ Children golf tournament Sunday at Pine Acres Country Club. Pictured, from left, are Kirk Stauffer, Pine Acres PGA Pro; Mick Marshall, CARE board member and tournament co-chair; Jeff Burgess; Josh Stauffer; Keith Stauffer; Mike Cercone; and Norm Strotman, CARE board member and tournament co-chair. July 28, 2016 – CARE for Children’s Therapeutic Recreation Day Camp for children who receive school-based therapy services is funded in part this summer through community impact funding through the United Way of the Bradford Area, Inc. The camp is being held over eight days in June, July, and August with many activities featuring an Olympics theme. During the day camp, CARE kids take part in inclusive activities such as arts and crafts, swimming, story sessions, music, and gym sessions. 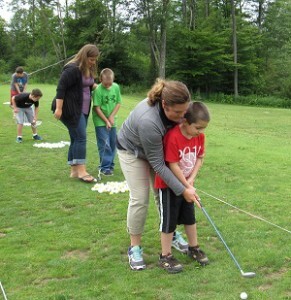 The camp is hosted each year at the University of Pittsburgh at Bradford Sports and Fitness Center with some days featuring field trips to Good Times of Olean and Pine Acres to golf. Summer day camp is one of the many therapeutic recreation programs that CARE offers each year, which serves as an extension of traditional therapy services and provides children with disabilities the opportunity to socialize, try new things, and the program hopes to promote life-long health and well-being. July 24, 2016 – Pine Acres Country Club will host the 23rd annual CARE ‘fore’ Children Golf Tournament, Sunday, August 7, 2016. Tournament sponsor is the Zippo/Case Museum. The tournament is a four-person scramble with an 8:30 a.m. shotgun start. Flighting is based on the team member with the lowest handicap. To find out about tournament sponsorship opportunities, please contact Leslie Kallenborn at CARE for Children at 814-362-4621. July 13, 2016 – Pine Acres Country Club sponsored CARE for Children’s Adaptive Golf Outing for children of all abilities on Wednesday afternoon. Pictured is CARE physical therapist Dana Pence, who is helping Brady Haney,8, on the driving range. Brady is the son of Josh and Joy Haney of Bradford. An additional 13 children ages 6 to 16 hit on the driving range, practiced on the putting green and hit balls on the course under the volunteer instruction of PGA pro Kirk Stauffer. May 26, 2016 – CARE for Children, the lead agency for McKean County Partner- Safe Kids Pennsylvania, has partnered with the Bradford Area School District and the United Way of the Bradford Area, Inc. to promote bicycle safety and helmet use through a school-based program for Kindergarten students in the Bradford Area School District. Staff members from CARE for Children and volunteers from the United Way and the Kiwanis Club of Bradford are providing a brief bike safety program to each Kindergarten class at George G. Blaisdell Elementary School throughout the week of May 23rd. “The school-based program’s goal is to support parents’ efforts to keep their children safe and injury free while on their bikes, scooters and skateboards,” according to Kimberly Engstrom, M.Ed., CARE Preschool Director and bike safety educator. Through Community Impact funding from the United Way, each Kindergarten student received a free bicycle helmet which was properly fitted by a trained helmet fitter. This program will provide helmets for over 180 students. Students also received an identification sticker for parents to complete and place inside the helmet for emergency contact information. “When reviewing the request for funding for this program, the UWBA Board of Directors was not only impressed with, but in agreement with, the notion of targeting the younger age group for bicycle safety and promoting helmet use. Oftentimes, it may be more difficult to change the habits of older kids, whereas a five or six year-old may be just learning to ride a bike so wearing a helmet becomes part of the routine from the beginning,” said Mandi Wilton Davis, Executive Director of the United Way of the Bradford Area, Inc.
“Many parents don’t realize that bicycles helmets are mandatory in Pennsylvania for any child under age 12,” said Engstrom. Helmets are also required for children who are riding in a bicycle restraining seat or in a trailer being towed by a bicycle. Children’s toys known as “big wheels” are excluded. The bike helmet law is intended to encourage children to wear helmets. People cited for violating the law will have their citation dismissed if they buy a helmet. According to the National Safe Kids campaign, bike helmets reduce the risk of head injury by 85 percent and the risk of brain injury by almost 90 percent. The group’s research also shows that every dollar spent on bicycle helmets saves three dollars in medical costs. The maximum fine for people who don’t buy a helmet is $25. According to Safe Kids Worldwide, more children ages 5 to 14 are seen in emergency rooms for injuries related to biking than any other sport. Properly fitted bike helmets can reduce the risk of severe brain injuries by 88 percent; however, only 45 percent of children 14 and under usually wear a bike helmet. McKean County Partner- Safe Kids Pennsylvania is a collaborative effort of local organizations, businesses, and individuals who support child safety and injury prevention efforts targeted to local needs. CARE for Children provides the leadership and fiscal oversight and support of the program. For more information go to www.careforchildren.info. May 25, 2016 – Rainbow Corner Preschool, part of CARE for Children, will be hosting a series of Early Learning Summer Programs in June, July, and early August, for both preschool age children and toddlers, at the Ashley Booth Griffin CARE for Children Center in Bradford. The Preschool Day Camp, for children aged three to five years, will focus on STEM (Science, Technology, Engineering, and Math) activities and promote Early Literacy. Two four-week sessions will focus on key early learning areas, fun activities, special guests, and outdoor play on CARE’s playground which will be used as an outdoor classroom. A Toddler Playgroup is available for toddlers who are 24 to 42 months of age. The summer playgroups will encourage children to explore the world around them by using their senses, creativity, and imagination. The playgroup will promote language skills through music, story-telling, pre-literacy activities, and creative play in a language rich environment. Children do not need to be enrolled at Rainbow Corner Preschool or Toddler Playgroup to attend the summer programs. Parents may register their child for one or both sessions. There is a fee to attend the summer programs. For more information, contact CARE for Children. Registration forms are also available on the CARE website at www.careforchildren.info/summerearlylearning. April 15, 2016 – The week of April 10th through April 16th is the national celebration of the “Week of the Young Child”. CARE for Children’s Early Learning program hosted several activities to mark the occasion, promote early learning in the community and promote family engagement. The highlight of the week, Rainbow Corner Preschool hosted a “Make It and Take It” STEM (Science, Technology, Engineering, and Mathematics) program, on Thursday evening, for preschoolers and their families. Students participated in hands-on activities, including planting seeds and other activities focused on the environment. Activity packets with materials for various STEM projects were prepared for students and their families to complete at home. A pizza party finished the evening. The program was made possible through CARE’s partnership with the Bradford Area School District and Race to the Top grant funding. 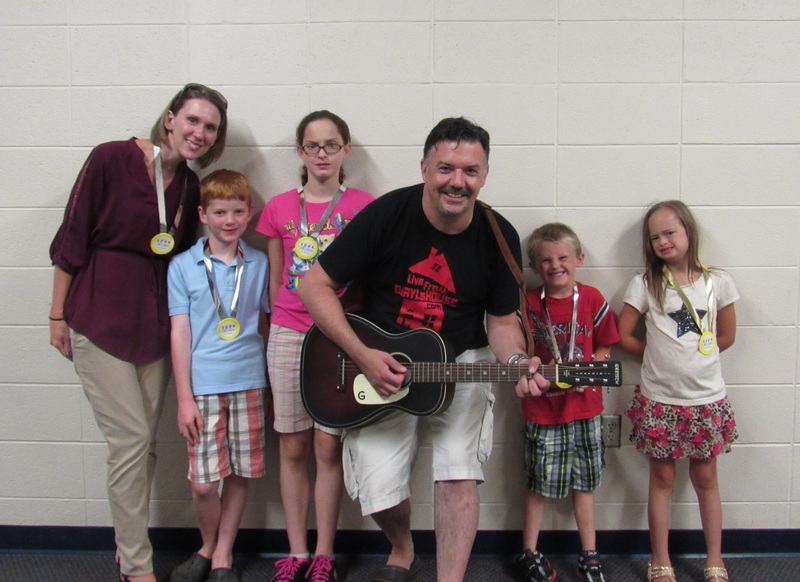 Musical guest and guitarist Jim Ronan visited Rainbow Corner to play beach songs. Randy Durner, Reverend Stacey Fussell and Bob Jarrett, members of the Bradford Kiwanis Club, helped preschoolers prepare English muffin pizzas for a snack. Preschoolers participated in the tenth annual Pennsylvania One Book, Every Young Child program, which focuses on the importance of early literacy development in preschoolers. CARE board members Mick Marshall and Anne Hardy visited Rainbow Corner to read Kite Day: A Bear and Mole Story, by Will Hillenbrand, the 2016 PA One Book selection. Each child received a copy of the book to take home and share with their family. Other highpoints from the week included specially designed lessons centered on the week’s beach theme and included a beach day, silly sock day, favorite t-shirt day, and pajama day. Rainbow Corner Preschool is an inclusive developmental program for children ages 3 to 5 years old and also hosts a toddler developmental playgroup for children ages 24 to 42 months of age. For more information visit www.careforchildren.info. 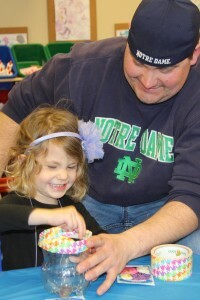 Pictured: Claire Henretta, age 3, and her father Matt Henretta, work together to prepare a container for planting flower seeds. This was one of the hand-on projects featured as part of Rainbow Corner Preschool’s “Make It and Take It” STEM night for preschoolers and their families. April 15, 2016 – CARE for Children, a non-profit organization that provides services to children of all abilities, will be sponsoring a free program to address “Children and Seizures” with Andrea Zonneveld, Community Education and Events Coordinator from the Epilepsy Foundation Western/Central Pennsylvania (EFWCP). The special program for parents and/or caregivers of children with a medical condition will be held the evening of Wednesday, May 4, 2016 at 6:00 p.m. at the University of Pittsburgh at Bradford in the Mukaiyama University Room. The program will include dinner, giveaways and materials. According to the Epilepsy Foundation, 1 in 26 Americans will develop epilepsy in their lifetime. Epilepsy is a neurological disorder that causes an individual to have recurring seizures. “Children and Seizures” will address how to recognize seizures, how to respond with the appropriate first aid, how epilepsy is treated and how those treatments could affect learning. The program will also introduce some of the many programs and services offered by the Epilepsy Foundation Western/Central Pennsylvania. The foundation is a private, non-profit service organization providing public education and supportive services to individuals and families affected by epilepsy/seizure disorders. Andrea Zonneveld has worked for the EFWCP for over 5 years, providing seizure recognition and first aid training to schools and other community organizations throughout the western Pennsylvania, organizing the foundation’s involvement in the Highmark Walk for a Healthy Community in Erie, and helping to plan social events for families. Prior to joining the EFWCP, she earned a B.S. in Biological Sciences from Carnegie Mellon University. The program is free and open to parents/caregivers (2 per family). Advance registration is required by calling CARE for Children at (814) 362-4621 or email reception@careforchildren.info. Health professionals, educators, therapists, and community members may also register for the evening program. There is a $12.00 fee per person. The registration deadline is Wednesday, April 27th. There will be a separate program Wednesday, May 4th at 2:00 p.m. at CARE for Children that is open to Early Learning and Early Intervention professionals. March 29, 2016 – CARE for Children’s Early Learning Programs are accepting registrations for the upcoming school year. Rainbow Corner Preschool is currently registering children who will be 3, 4, and 5 by October 1st for the 2016-2017 school year. Two schedules are available for the 2016-2017 school year. A 3 day program will be offered on Tuesday, Wednesday, and Thursday from 8:00 – 11:00 a.m. and a 5 day program will be offered Monday through Friday from 8:00 – 11:00 a.m. An extended care program will be offered daily from 11:10 a.m. – 12:15 p.m., as needed and for an additional daily charge. A toddler developmental playgroup is also available for children 24-42 months of age. The playgroups will be held Monday and Friday from 8:30 – 10:30 a.m. and focus on social interaction, language development, and age-appropriate structured play. Children may attend one or both playgroups. Rainbow Corner Preschool and the Toddler Developmental Playgroup are located at the Ashley Booth Griffin CARE for Children Center on East Main Street in Bradford. For more information, please call CARE for Children or visit www.careforchildren.info. 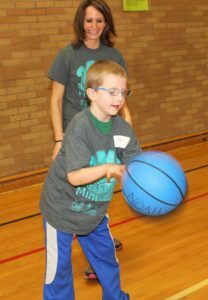 March 18, 2016 – CARE for Children’s held its 15th annual basketball mini-camp on Saturday at the Bradford Family YMCA with over 50 children in attendance. Sponsored by the Bradford Rotary Club, the camp is one of CARE’s most anticipated therapeutic recreation programs each year. Pictured is CARE Occupational Therapy Assistant, DeAnn Persichini and Braelyn Taylor, age 7, a first grader at Port Allegany Elementary School. Braelyn is the daughter of Mark and Corrie Taylor of Port Allegany. The camp provides the opportunity for both boys and girls of all abilities to work on gross and fine motor skills, socialization, and physical fitness. The basketball camp aims for participants to learn about the game in an inclusive environment and have fun with their peers. CARE for Children’s therapy staff, teachers, and community volunteers were on hand to help adapt components of the game. Volunteers manned skills stations which focused on different activities including passing, dribbling, shooting, layups, ball handling and defense. Each child in attendance received a t-shirt and a basketball. Lunch for all participants was donated by Togi’s Restaurant. March 8, 2016 – PNC Bank recently made a $10,000 contribution to Rainbow Corner Preschool, an approved Pre-Kindergarten Scholarship Organization, through the State of Pennsylvania’s Educational Improvement Tax Credit Program (EITC). Contributions made through the EITC program help CARE provide scholarships to eligible Pre-K students to attend preschool, making early learning more accessible and affordable for working families. Ainsley Haffner, assistant branch manager at PNC Bank in Bradford, recently visited Rainbow Corner Preschool at the Ashley Booth Griffin CARE for Children Center. She spent time in the early learning classroom and read students the book 10 Little Rubber Ducks. 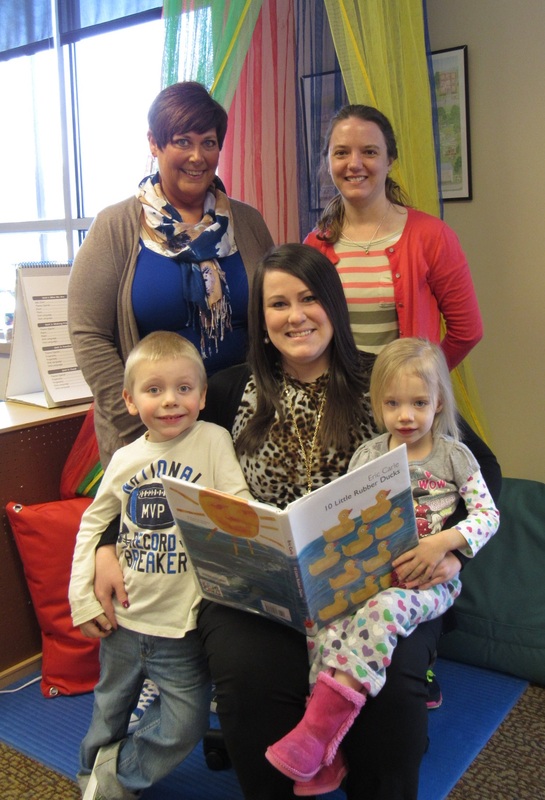 Preschoolers (l-r) Aaron Forstner and Carly Haney are shown with (l-r) Jan Stiles, preschool aide; Haffner; and Kimberly Engstrom, preschool director. Forstner, 4, is the son of Travis and Julie Walter and Haney, 3, is the daughter of Joshua and Jennifer Haney. February 26, 2016 – Northwest Savings Bank recently made a $3,000.00 contribution to Rainbow Corner Preschool, an approved Pre-Kindergarten Scholarship Organization, through the State of Pennsylvania’s Educational Improvement Tax Credit Program (EITC). Contributions made through the EITC program help CARE provide tuition to eligible Pre-K students to attend preschool, making early learning more accessible and affordable for working families. Northwest Savings Bank’s contribution will be for the 2016-2017 school year. 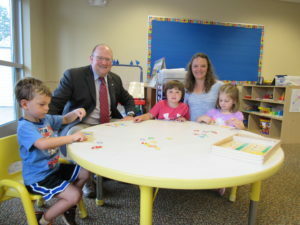 Norm Strotman, senior vice president, regional commercial lender at Northwest Savings Bank, visited with Rainbow Corner Preschoolers at the Ashley Booth Griffin CARE for Children Center on Friday. 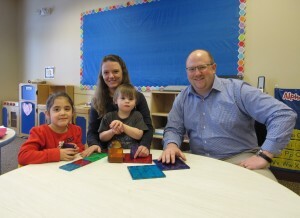 Preschoolers Maddelina Romero and Carmen Comes are shown with Kimberly Engstrom, preschool director and Strotman. Romero, 4, is the daughter of Santana Romero and Jesse Poe of Bradford and Comes, 3, is the son of Blair and Andrew Comes of Bradford. 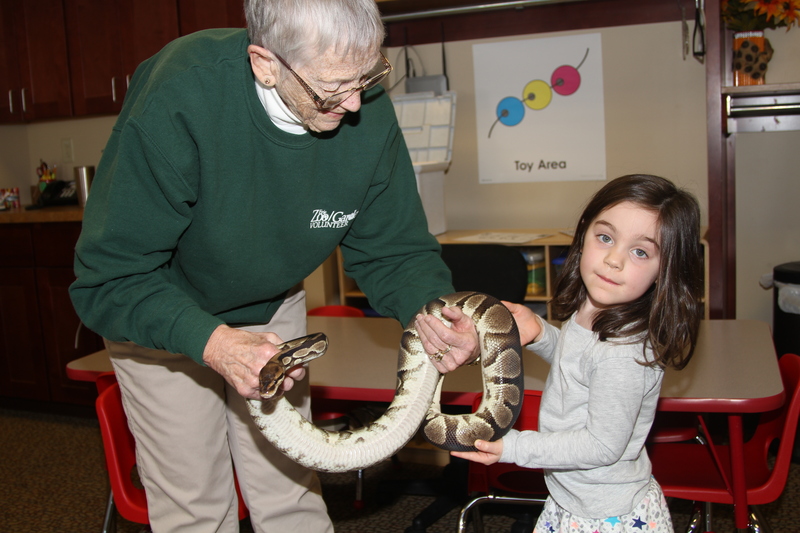 February 25, 2016 – The Erie Traveling Zoo visited CARE for Children on Thursday. The program, led by Amy Heisler, the zoo’s offgrounds coordinator, and Donna Christensen, volunteer educator, revolved around the rhyming alphabet book “Chicka Chicka Boom Boom,” by Bill Martin Jr. and John Archambault. Preschoolers from Rainbow Corner Preschool listened to the story and watched the alphabet come to life with four animal visitors including an alligator, bunny, chinchilla, and dove. The students practiced letter identification and sounds while learning about each animal. 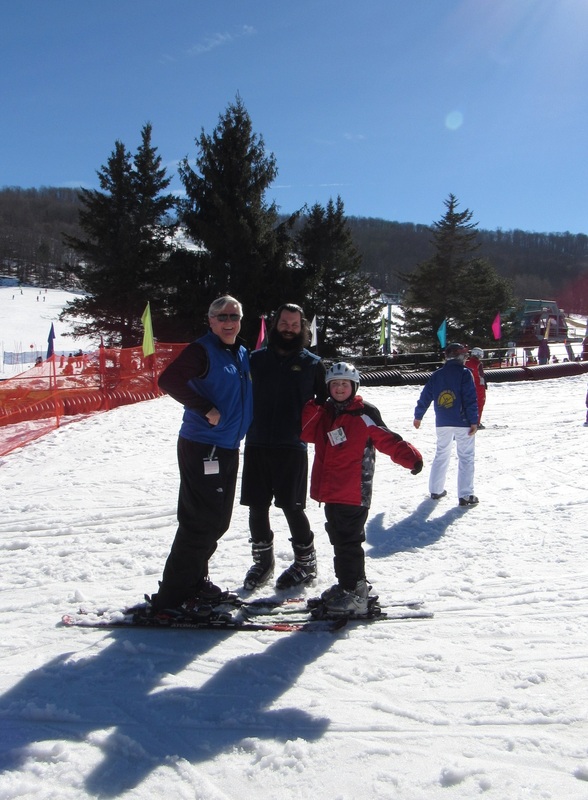 February 15, 2016 – CARE for Children held its annual Adaptive Ski Outing at Holiday Valley Ski Resort on Monday, with eight children in attendance. Each child was paired with one or more volunteer instructors and given expert instruction as part of the Holiday Valley Lounsbury Adaptive Ski Program, which is a chapter of Disabled Sports/USA. 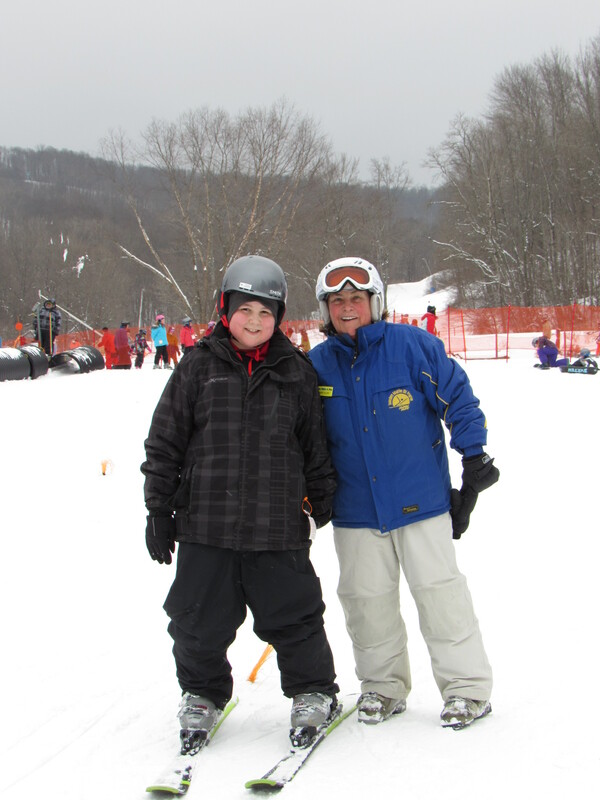 Pictured is Landan Pierotti, age 9, along with long-time Lounsbury Adaptive Ski Program volunteer, Mary Ellen Racich. Pierotti, is the son of Holly Reed of Bradford. The outing was sponsored by the Rotary Club of Port Allegany and Todd Busses donated transportation to and from Ellicottville, N.Y. The Adaptive Ski Outing is just one of many therapeutic recreation and respite programs that CARE provides for children of all abilities. 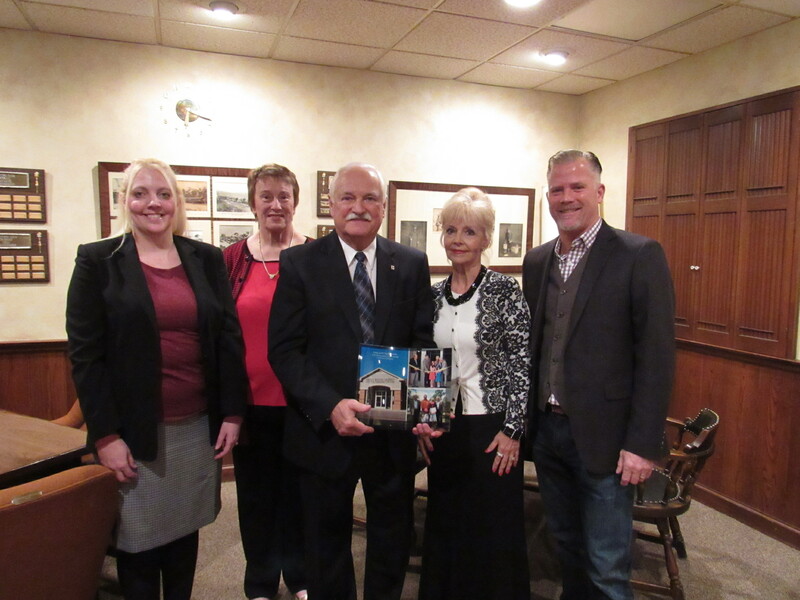 December 4, 2015 – The Annual Meeting of the CARE for Children Board of Directors was held Thursday evening at the Bradford Club. Karen Gelston, board president, provided a review of CARE’s 2014-2015 fiscal year. “Last year was a busy and rewarding year for CARE for Children which included the completion of a three year strategic plan, an increase in the overall number of therapy services provided, and the addition of Social Work to the roster of services,” Gelston said. The CARE Board of Directors, for the first time, honored all employees who have reached milestone years of service at the organization. Greg Booth, board vice president, recognized employees, including Kimberly Engstrom, M.Ed., preschool director, for her 15 years of service. During her tenure at CARE, Engstrom has worked to build the early learning program into a high quality, progressive program that meets the needs of typical children and children with delays and disabilities. Other staff reaching milestones included: 10 plus years – DeAnn Persichini, COTA/L, Occupational Therapy Assistant; Janice Stiles, Preschool Aide; Valorie Coast, Finance and Office Manager; Tina M. Martin, Executive Director; and 5 plus years – Kimberly Miller, OTR/L, Occupational Therapist; Dana Pence, PT, Physical Therapist; Barbara McGarry, Preschool Aide; and Ashley Carlson, MOT, OTR/L, Pediatric Therapy Services Director. The CARE for Children Board of Directors will host a reception as a part of their annual meeting on Thursday, December 3 at 6:00 pm at the Bradford Club. During the event, the Board will honor CARE staff who have reached the 5, 10 and 15 year milestones for years of service to the organization. The cocktail reception will feature heavy hors d’oeuvres and a cash bar. Following the program, guitarist Jim Ronan will perform. Reservations for the annual meeting will be accepted through Monday, November 30th, and can be made by calling the CARE office or by emailing reception@careforchildren.info. The cost is $20.00 per person. November 16, 2015 – CARE for Children, a non-profit organization that provides services to children of all abilities, will be sponsoring a free, family support program to address “Is Your Child a Picky Eater?” with Mariann Kahle, RD, LDN as presenter. The program will be held Thursday, November 19, 2015 at the Ashley Booth Griffin CARE for Children Center at 6:00pm. Kahle, a Wellness Coordinator at Medicor Associates, will offer strategies on how to combat picky eating and how to introduce a balanced diet into a picky eater’s life. Topics covered will include common causes of picky eating and feeding issues; and the the impact of child’s diet and nutrition on a child’s growth. CARE Occupational Therapist, Ashley Carlson, MOT, OTR/L will be on hand to discuss food-related sensory issues and ways to overcome these issues. To register for the program, contact CARE for Children by phone at (814) 362-4621 or email reception@careforchildren.info. The program is free and open to parents and caregivers of children of any age. Childcare is available during the program for children age two and up but advance registration is required. This Family Support Program is funded by a United Way of the Bradford Area, Inc. Community Impact Grant. October 19, 2015 – CARE for Children is offering a monthly Best Baby Playgroup, to be held the third Wednesday of the month, October through May. The playgroup begins Wednesday, October 21st, and will be held at the Bradford Area Public Library, Early Learning Center at 6:00 p.m. The free, informal playgroups are geared for babies, toddlers, and parents and will include a short activity, a chance for children to play, and an opportunity for families to network. The playgroups will be led by CARE teachers and therapists. CARE for Children’s Best Baby Series of playgroups and workshops promote parents as their children’s first and best teachers and focuses on supporting the unique developmental needs of children birth to 24 months. The program is funded in part by a Community Impact grant from the United Way of the Bradford Area, Inc.
October 13, 2015 —Seneca Resources, the exploration and production segment of National Fuel Gas Company, has donated $2,000 to CARE for Children in support of the nonprofit organization’s Child Safety and Injury Prevention program. 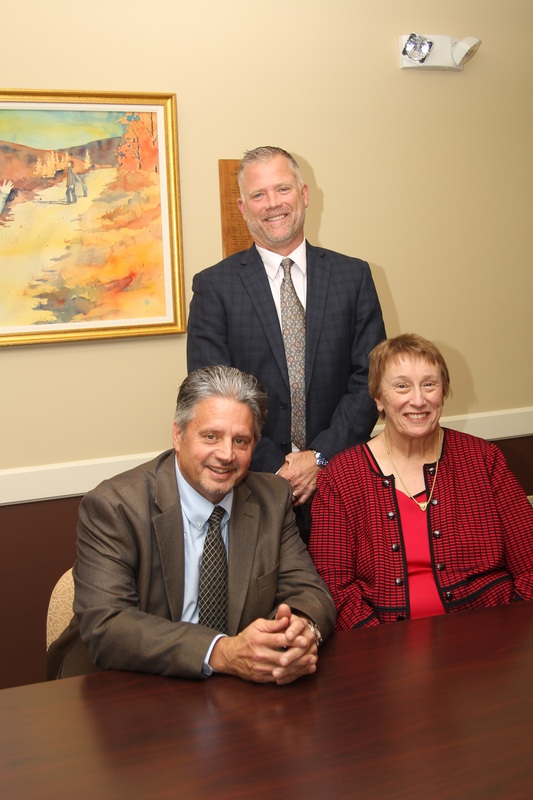 CARE for Children, the lead agency for Safe Kids Pennsylvania – McKean County Partner, aims to promote the prevention of childhood injuries in McKean County through education, collaboration and advocacy. Carbon monoxide (CO) is a gas that you cannot see, taste or smell. Carbon monoxide poisoning can result from faulty furnaces or other heating appliances, portable generators, clothes dryers, water heaters, or cars left running in garages. Each year, 184 children in the United States die due to carbon monoxide poisoning and more than 20,000 children visit the emergency room (Safe Kids Worldwide). CARE’s carbon monoxide detector program aims to provide a free detector and safety information to families who meet the following guidelines: McKean County residents with one or more children in the home; financial need; and must participate in a short survey at least thirty days after receipt of the carbon monoxide detector. To be eligible for the program, a short application must be filled out by the requesting family and all guidelines must be met. For more information on the carbon monoxide detector program, please contact CARE for Children at 814-362-4621 or visit www.careforchildren.info. CARE for Children is a non-profit organization which provides child safety and injury prevention initiatives, pediatric therapy services, early learning programs, and community outreach services for children of all abilities in McKean County, Pennsylvania and the surrounding region. Photo Caption: Chris Spaich, firefighter/paramedic (left), and Chris Salerno, firefighter/EMT (right), from the City of Bradford Fire Department visited the Ashley Booth Griffin CARE for Children Center on Tuesday and reviewed carbon monoxide safety tips. 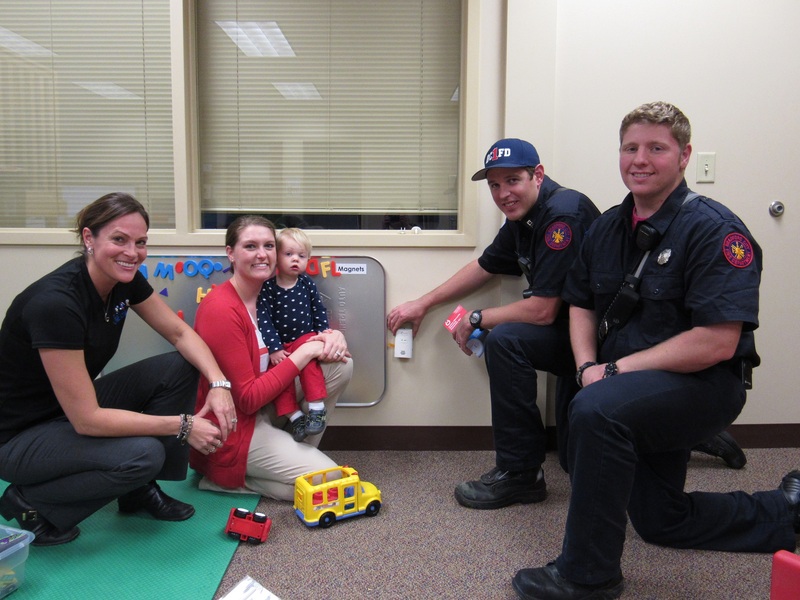 Spaich and Salerno are shown demonstrating how to properly install a carbon monoxide detector with (from left) Chris Gibble, CARE Social Worker/Outreach Coordinator; Kylie Atteberry, CARE Speech-Language Pathologist; and Atteberry’s son, Griffin. Carbon monoxide detectors are best installed in a central location near sleeping areas and at least fifteen feet away from heating or cooking appliances. A carbon monoxide detector should never be blocked by furniture, curtains or other objects, as restricted airflow can affect its function. CARE for Children is launching a carbon monoxide detector program for families in need through a contribution from Seneca Resources. September 29, 2015 – CARE for Children and the McKean County Department of Human Services will be sponsoring an early learning professional training, presented by Rene Hendrickson, OTR/L, Behavior Concerns: Are They Sensory Related? The training will be held Monday, October 12, 2015 at the Bradford Area Public Library from 9:00am to 3:00pm. Topics will include information and strategies for distinguishing between sensory-based and non-sensory based behaviors; intervention strategies and techniques; and an overview of sensory processing disorder. Hands-on sensory activities will be included in the training. The training will be geared for early intervention providers and service coordinators; educators; early childhood professionals; therapeutic support staff; school counselors; and para-professionals. Parents of children who may have sensory concerns are welcome to attend and full scholarships are available for parents or caregivers. Rene Hendrickson, OTR/L received her occupational therapy degree from the University of Florida. She began her career in adult rehabilitation and long term care; and for the last twenty years has worked predominantly in the school setting. Hendrickson has provided staff development training to school districts and private preschools addressing handwriting and handwriting readiness, sensory disorders and school based interventions, providing environmental modifications to enhance sensory functioning, and evaluating and providing compensation strategies for visual perception deficits related to school function. Hendrickson maintains her occupational therapy licensure in New Jersey, Delaware, and Pennsylvania. She resides in Hockessin, Delaware. The professional training is 5 early intervention infant/toddler hours or Act 48 hours. To register for the training, contact CARE for Children by phone at (814) 362-4621 or email at reception@careforchildren.info. Registration fee for the professional training is $40.00 and includes workshop materials and light refreshments. The registration deadline is Wednesday, October 7th. Rene Hendrickson, shown above, introduces a client to the therapy ball to improve body awareness during an occupational therapy session. September 18, 2015 – A car seat safety check was held Friday at the Ashley Booth Griffin CARE for Children Center in Bradford during Child Passenger Safety Week. Corporal Lance Schimp, PA State Police Kane Barracks, at left, and Dan Woods, Deputy, McKean County Sheriff’s Office, are shown checking the fit of a car seat for Jordan Mawn, age 2. Jordan is the son of Marcy and Shawn Mawn of Eldred. Schimp and Woods, both certified child passenger safety technicians, helped educate families about choosing the right car seat for their child and checked to ensure car sears were installed properly. Twelve car seats were checked at the event which was sponsored by Safe Kids Pennsylvania – McKean County Partner, The Pennsylvania State Police, and CARE for Children. National statistics show that three out of four children are not as secure in the car as they could be because their car seats are not being used correctly (NHTSA). Child Passenger Safety Week aims to generate awareness about child car safety and highlights the importance of selecting and correctly using the proper child restraints (rear-facing, forward-facing, booster seat, seat belt). September 16, 2015 – The Pennsylvania State Police, Safe Kids Pennsylvania-McKean County Partner and CARE for Children are collaborating to provide car seat safety checks as part of Child Passenger Safety Week (September 13-19, 2015) during an event on Friday, September 18th from 8:00 a.m. – 12:00 p.m. at the Ashley Booth Griffin CARE for Children Center at 723 East Main Street in Bradford. The State Police will have certified technicians available to provide on-site safety seat inspections, and CARE staff will be on hand to pass out child passenger safety information. No appointment is necessary but if you wish to schedule a time call CARE at 362-4621. Motor vehicle crashes are the leading cause of preventable deaths and injuries to children ages 1 to 19 in the United States. When installed and used correctly, child safety seats can prevent injuries and save lives; child safety seats can reduce fatal injury by up to 71 percent for infants and 54 percent for toddlers ages 1 to 4 (Safe Kids Worldwide). For the best possible protection keep infants in the back seat, in rear-facing child safety seats, as long as possible up to the height or weight limit of the particular seat. At a minimum, keep infants rear-facing until a minimum of age one and at least 20 pounds. When children outgrow their rear-facing seats (at a minimum age one and at least 20 pounds) they should ride in forward-facing child safety seats, in the back seat, until they reach the upper weight or height limit of the particular seat (usually around age four and 40 pounds). Once children outgrow their forward-facing seats (usually around age 4 and 40 pounds), they should ride in booster seats, in the back seat, until the vehicle seat belts fit properly. Seat belts fit properly when the lap belt lays across the upper thighs and the shoulder belt fits across the chest (usually at age eight or when they are 4’9” tall). When children outgrow their booster seats, (usually at age eight or when they are 4’9” tall) they can use the adult seat belts in the back seat, if they fit properly (lap belt lays across the upper thighs and the shoulder belt fits across the chest). Safe Kids Pennsylvania- McKean County Partner is a collaboration of community organizations, business and individuals dedicated to promoting child safety and injury prevention through education, collaboration and advocacy. CARE for Children is the lead agency for Safe Kids Pennsylvania- McKean County Partner. August 2, 2015 – Pine Acres Country Club hosted the twenty-second annual CARE ‘fore’ Children Golf Tournament on Sunday. Approximately $18,000 was raised and all proceeds from the event benefit CARE’s free community outreach services for children with disabilities; pediatric developmental and preventative screenings; therapeutic recreation programs; child safety initiatives that prevent disabilities and fatalities from accidental injuries; and inclusive early learning programs. Zippo Manufacturing Company and W.R. Case & Sons Cutlery Company were the overall tournament sponsors. Lead sponsorship was provided by Richard S. Johnson and Marlene Ericson. CNB Bank, Highmark Blue Cross Blue Shield, and Northwest Savings Bank were flight sponsors. Seventy-five businesses and organizations provided flight, half-flight, par 3, tee, patron, and friend sponsorships for the tournament and over 65 businesses and individuals provided in-kind donations of prizes for the golfers and other services to support the tournament. Thirty-two teams comprised of 128 golfers made up the field. Pictured left are Richard Johnson, CARE board member and lead sponsor; Gary Winner, Keith Stauffer, Josh Stauffer, and Eric Hoops, winners of the CNB Bank flight; Kirk Stauffer, Pine Acres PGA Pro; and Bunny Comilla, CARE board member and Zippo tournament sponsor representative. July 15, 2015 – Pine Acres Country Club sponsored CARE for Children’s Adaptive Golf Outing for children of all abilities on Wednesday afternoon. Pictured is CARE Physical Therapist, Dana Pence, helping Logan Wyant, age 6, with his form. Logan is the son of Laci and Gavin Wyant of Bradford. An additional ten children aged 6 to 14 hit on the driving range, practiced on the putting green and then hit balls on the course under the volunteer instruction of PGA Pro Kirk Stauffer. 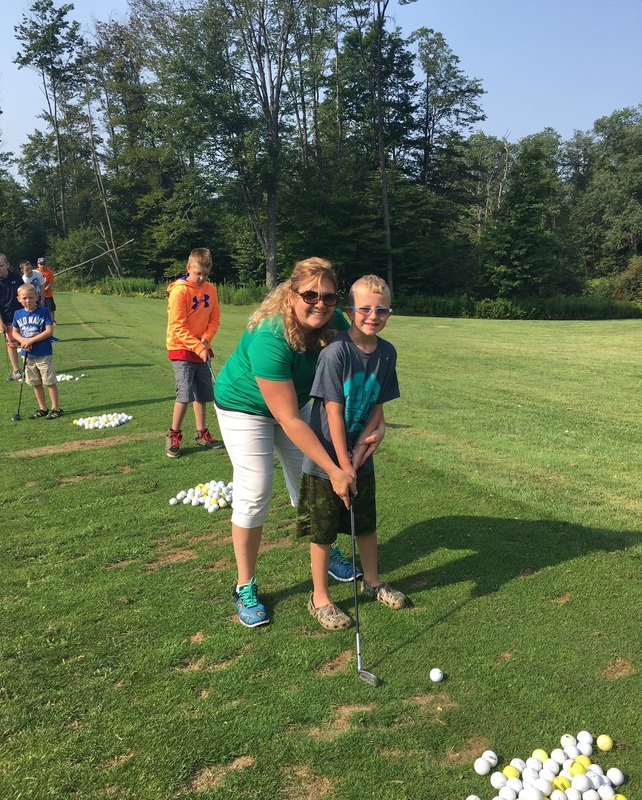 The CARE Adaptive Golf Outing is part of CARE for Children’s therapeutic recreation program for children who receive school based therapy services and/or have permanent disabilities. The program is funded in part by the Rotary Club of Bradford and therapeutic staff time is supported by funding from the United Way of the Bradford Area, Inc. Transportation was donated by Todd Busses of Eldred, PA.